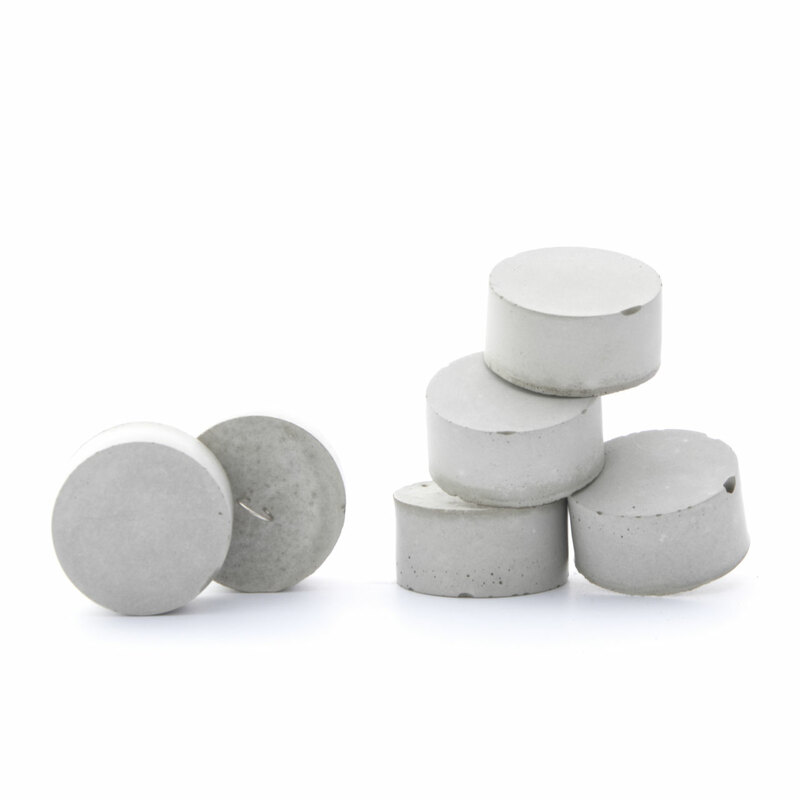 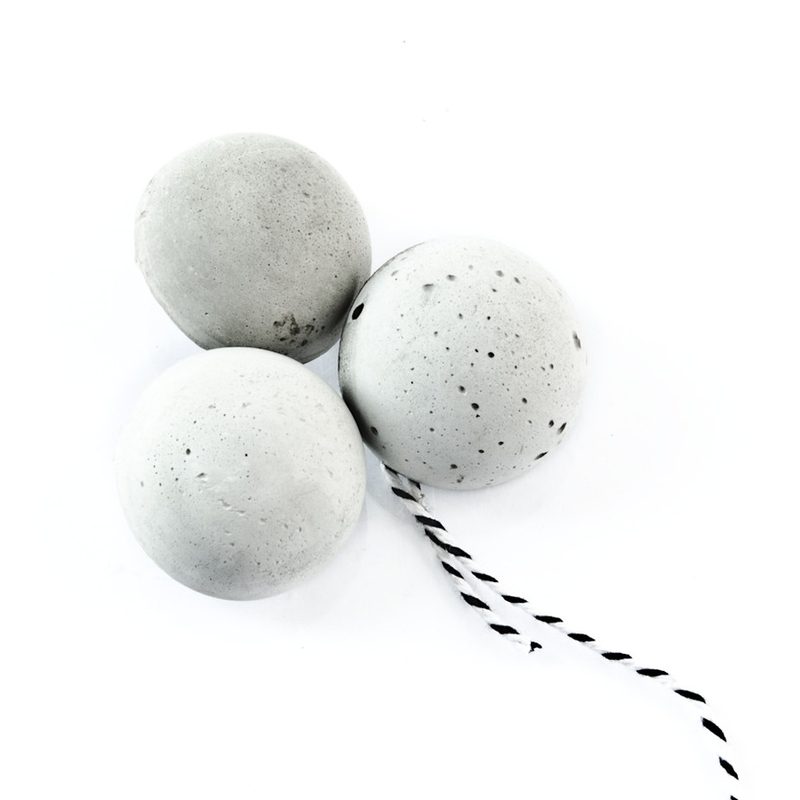 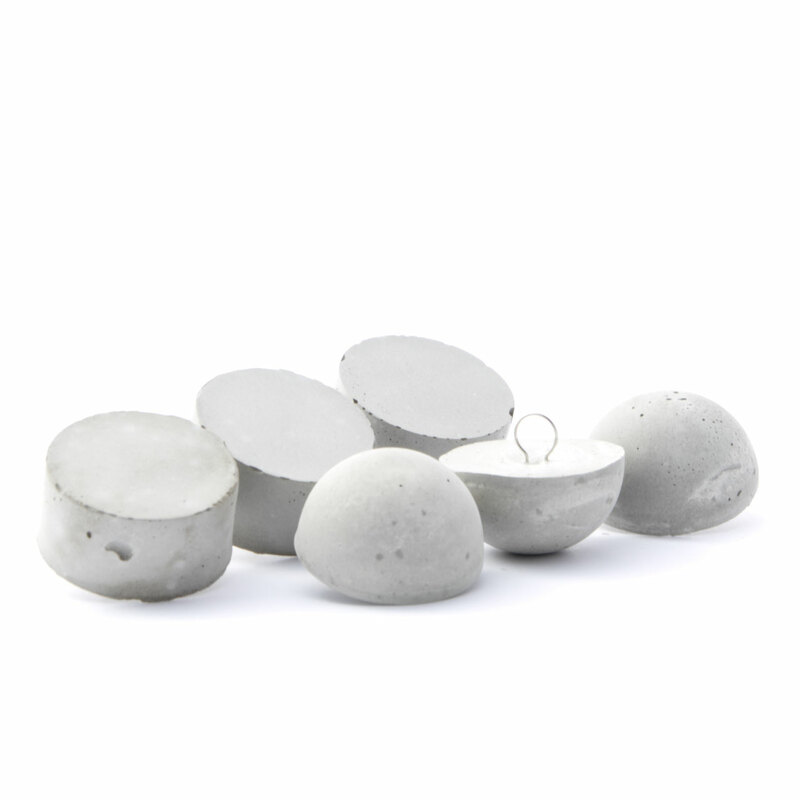 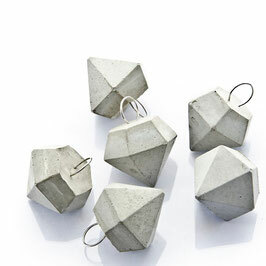 Wonderful simple and easy to style modern geometric concrete 'Half Moon' pendant ornaments. 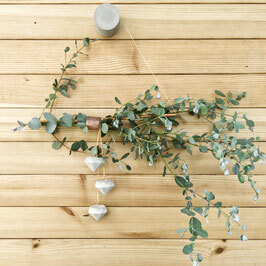 Wire hang them or string them up on your favourite twine or ribbon. 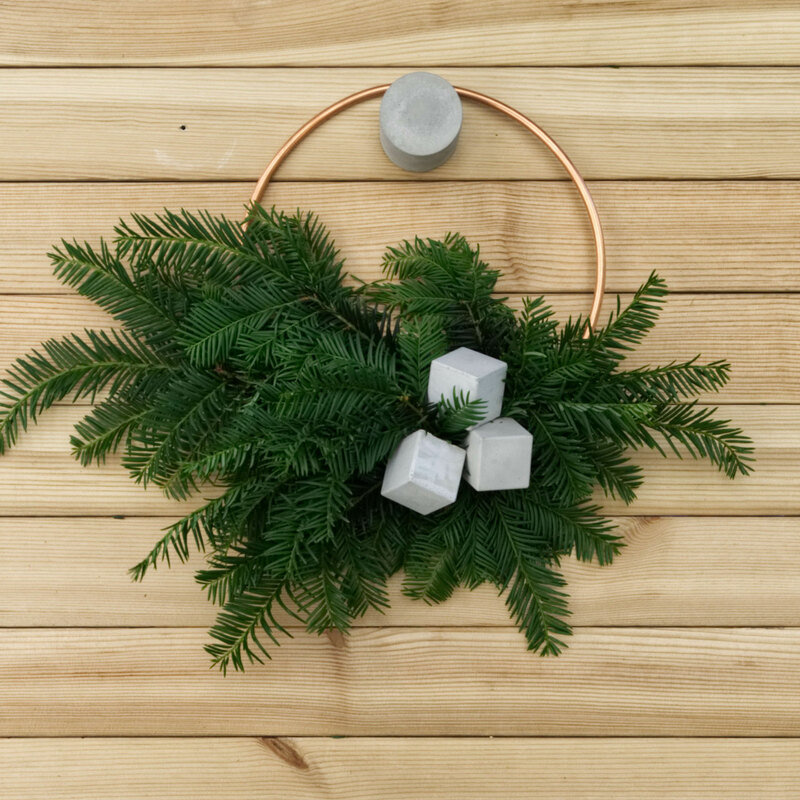 You can use them as unique gift tags to make your gift extra special or incorporate them in your wreath design all year around. 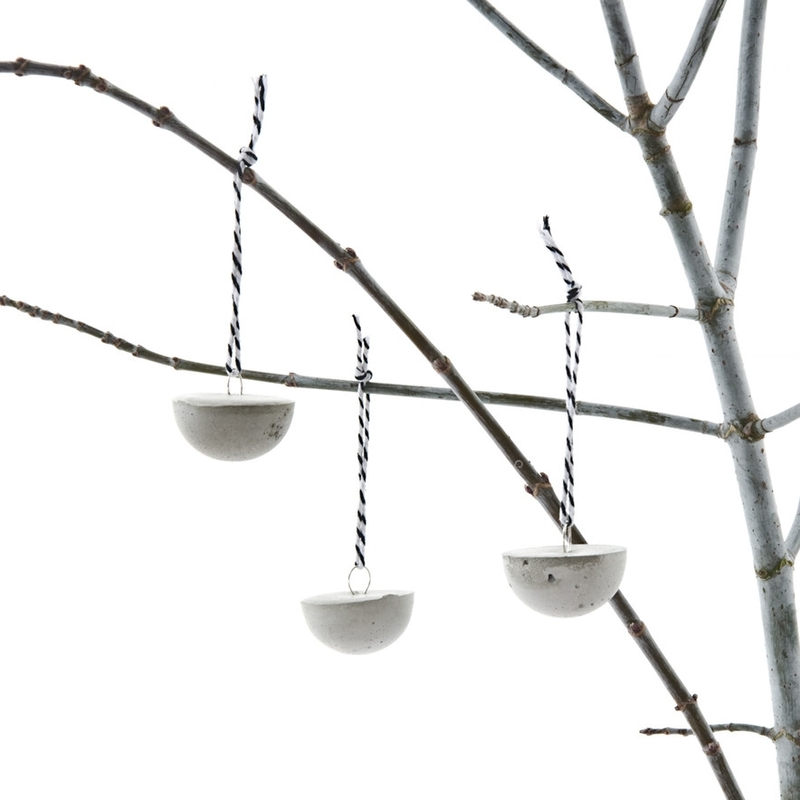 They are also pretty cute when added to an Easter branch or Christmas tree. ... Psst ... You could also browse my blog for even more ideas and DiY's! 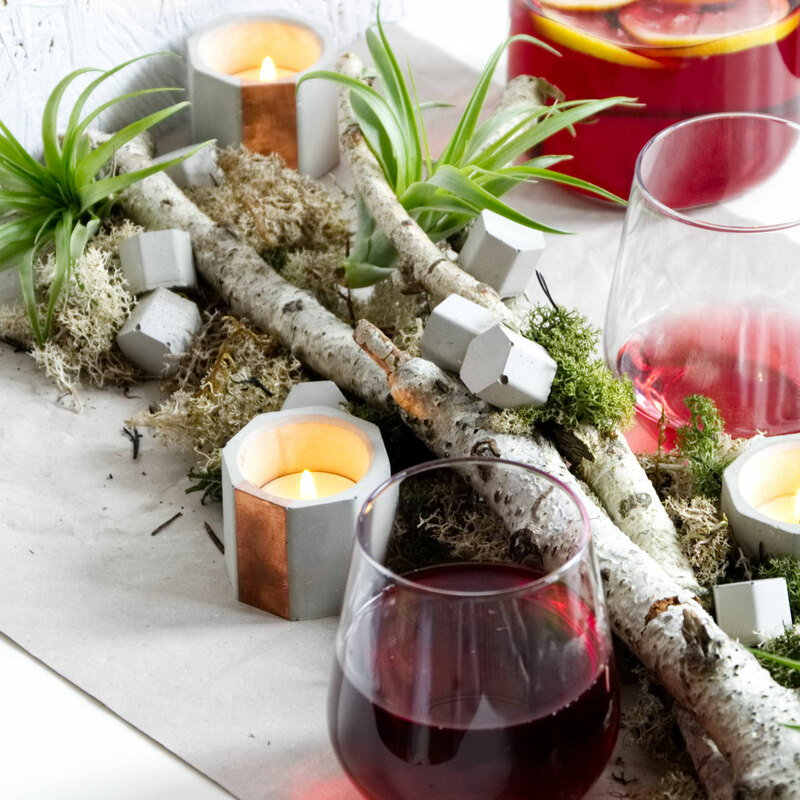 ... psst ... more designs and decor ideas are below, enjoy! 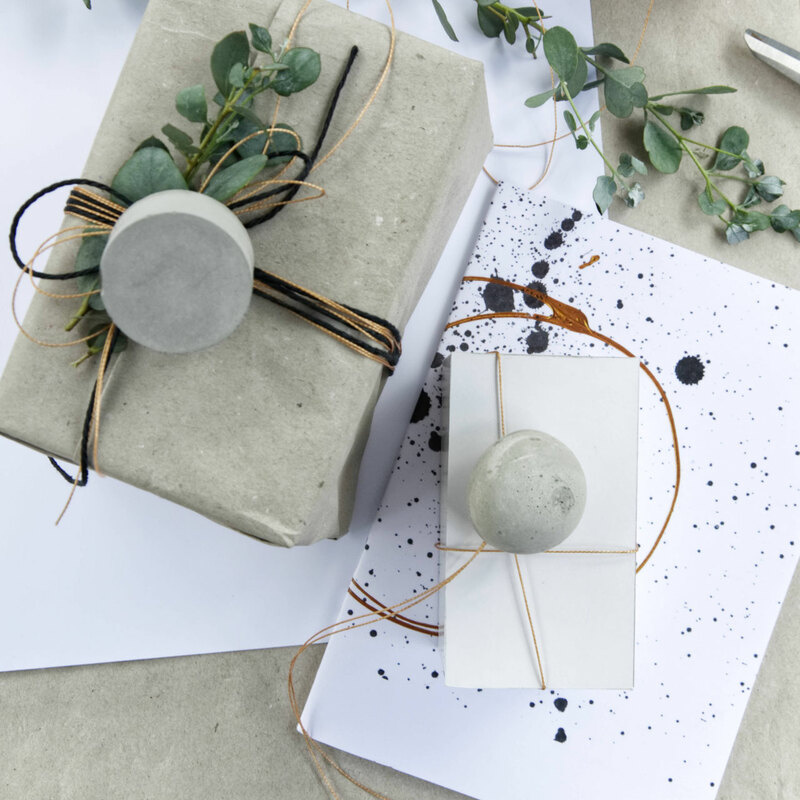 A fun button like concrete cylinder ornament which adds a new dimension to gift wrapping and branch, wreath or Christmas tree styling. 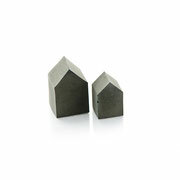 Each cylinder prism finishes with unique imperfections and in its own pale to mid grey colour. 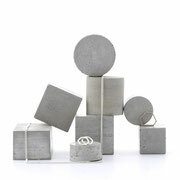 There is a classic minimal intriguing feel to them which will allow a match to many styles and designs. 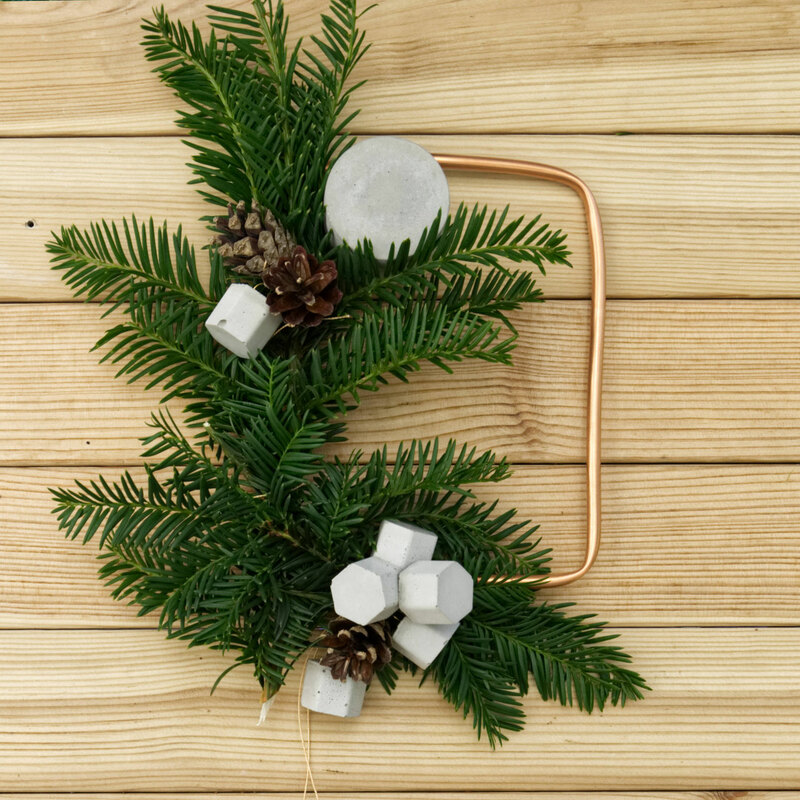 The generously sized loop will easily accommodate wire, ribbon or twine hanging options. 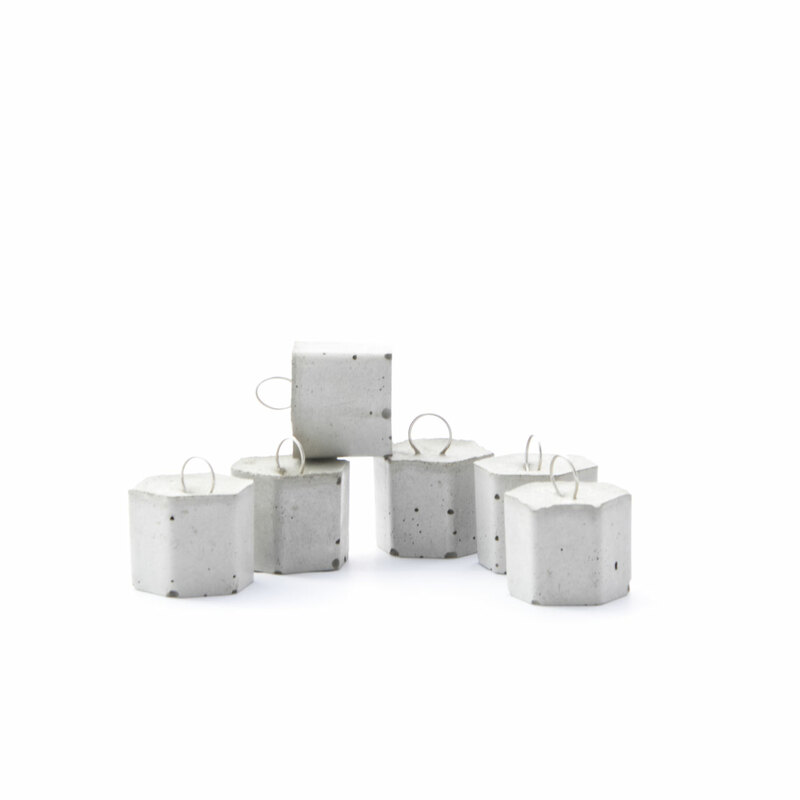 Customise your set size from 3, 6 to 9 and the colour of the loop, silver or gold? 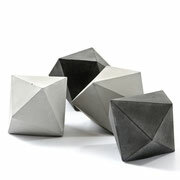 Browse up and down for more design, enjoy! 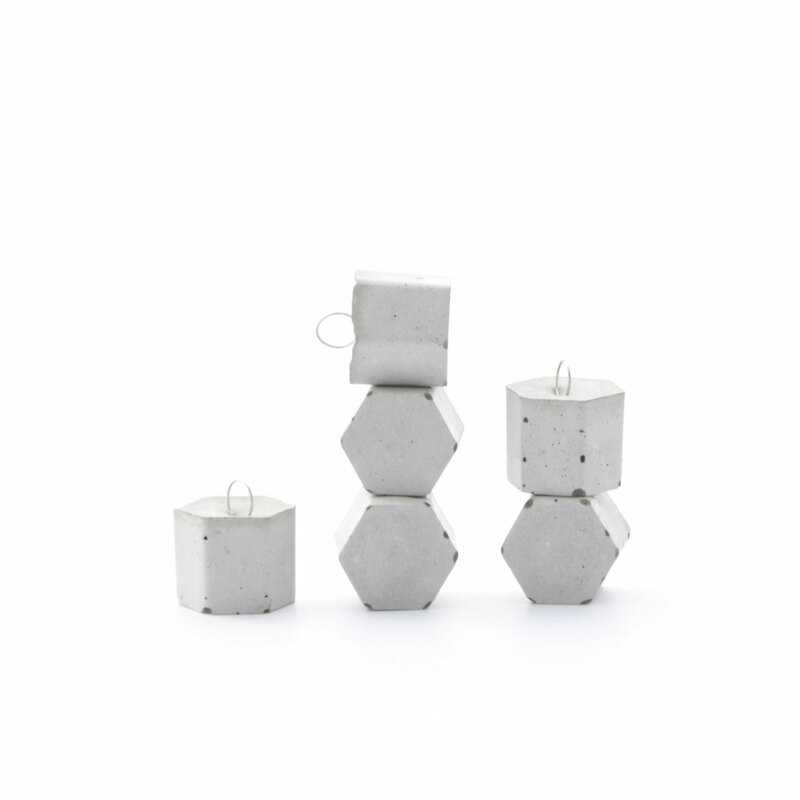 This set of six round concrete pendants comes with a geometric twist! 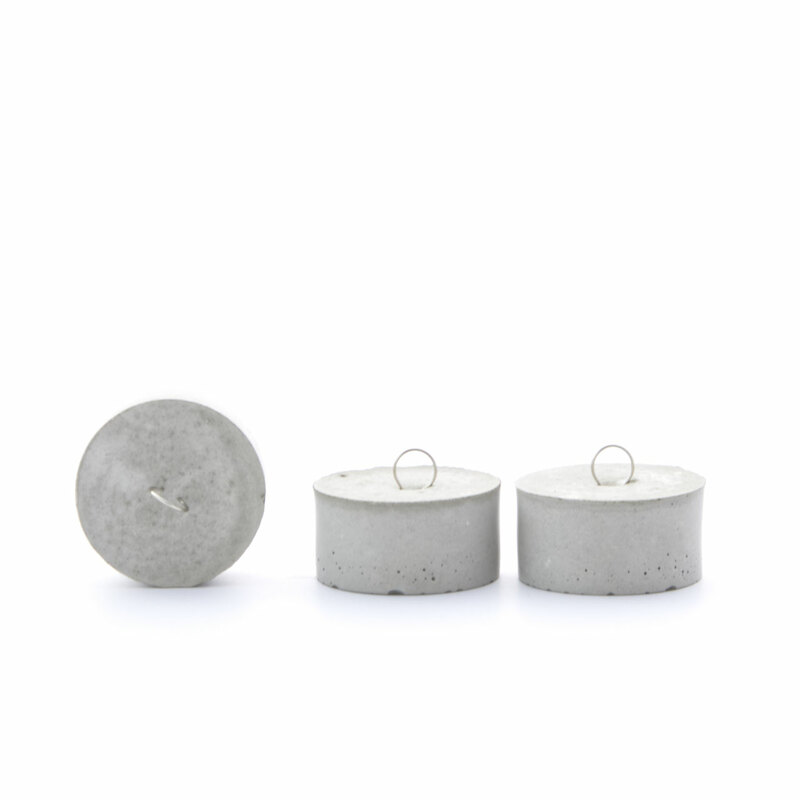 Based on the circle shape this set contains three cylinder and three half moon ornaments. 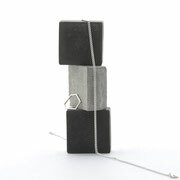 They are ready to hang with a choice of gold or silver loop affixed to one side. 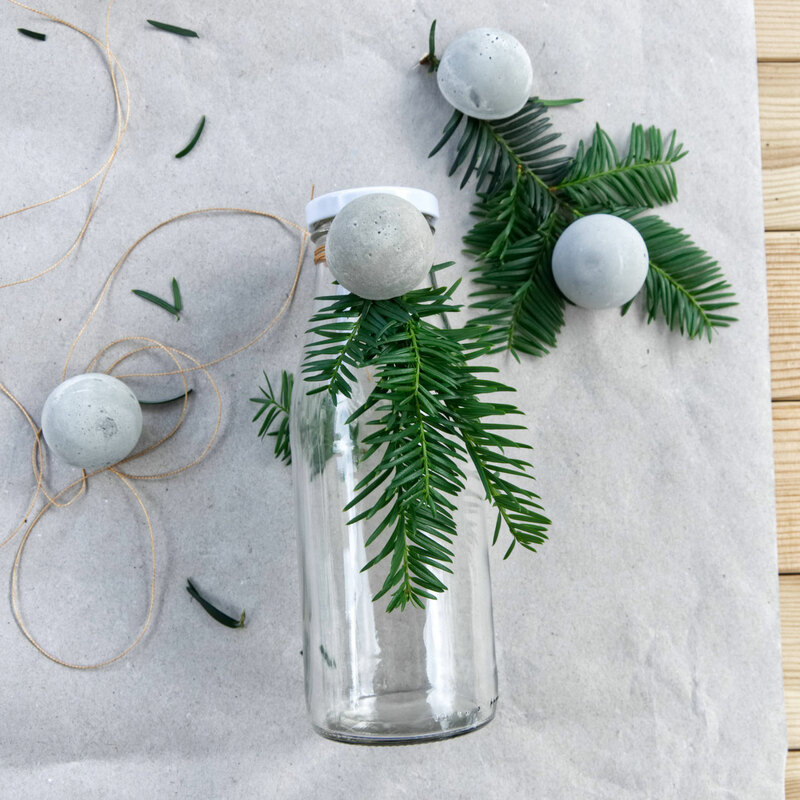 Simply tie them into a bundle of beautiful flowers, add them to autumn table setting or Christmas tree. 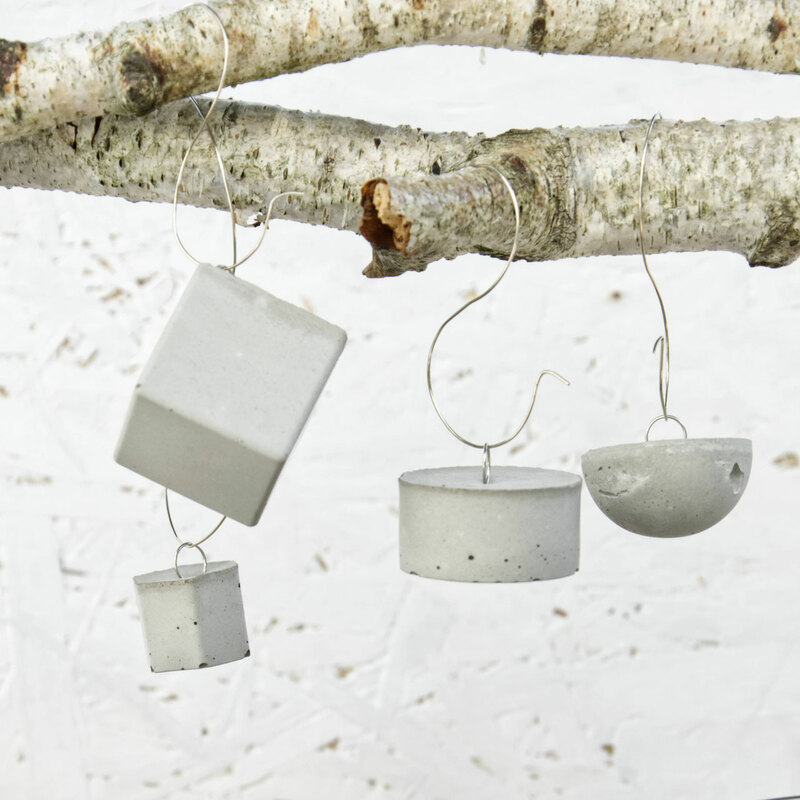 The possibilities are endless not matter what season! A modern hexagon set of 6 or 12 hexagon prism ornaments. 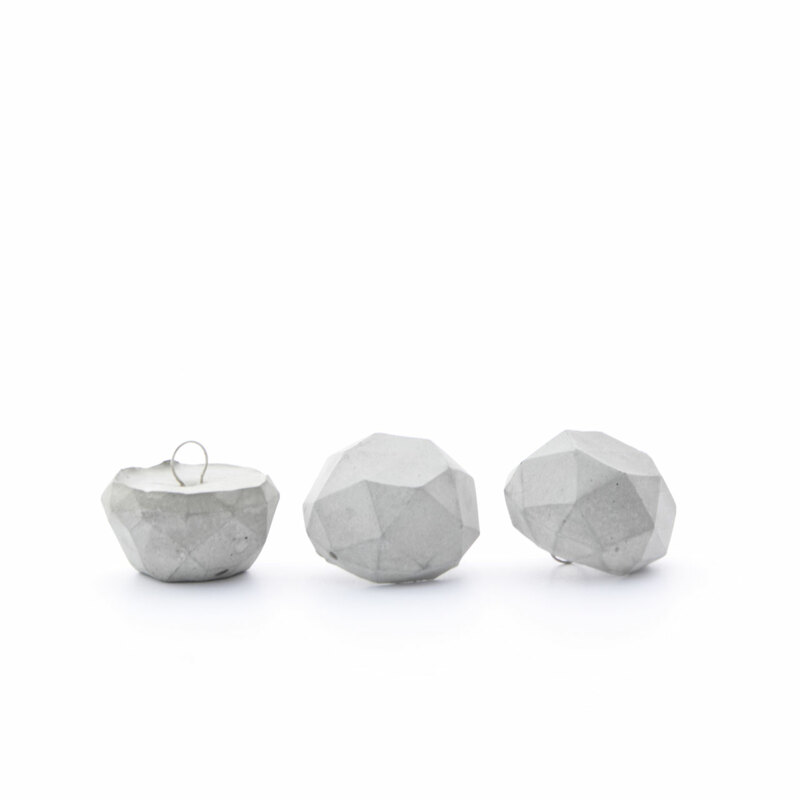 The pendants are fantastic accessories for gift wrapping with an unique minimal look, a tactile feel and just the right amount of silver or gold coloured bling - no-one will through them away! 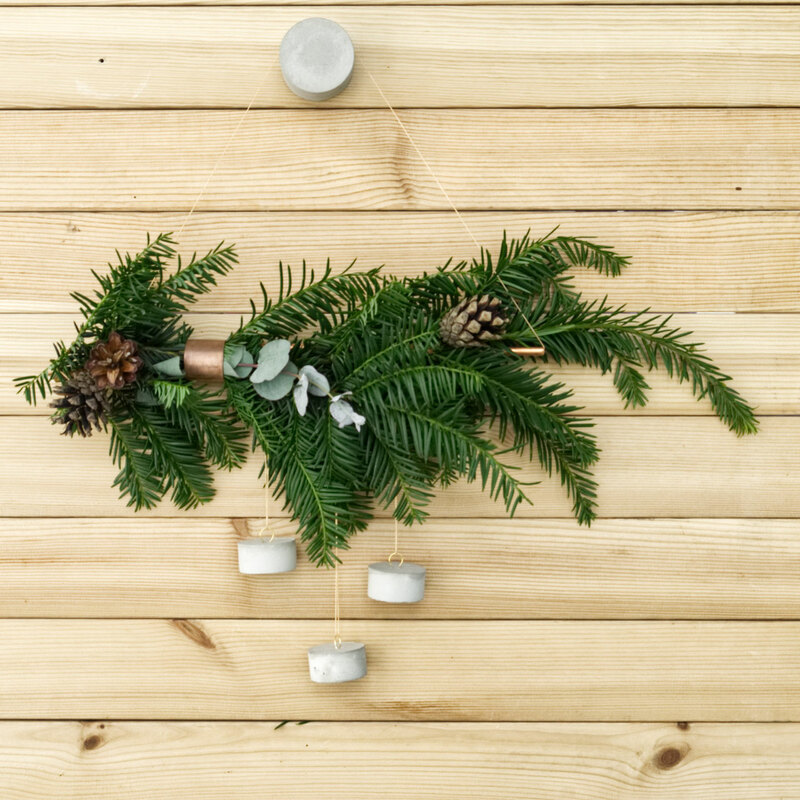 They are easily wire hung or string them up on your favourite ribbon or twine. Add them to your Easter branch, style your wreath or Christmas tree. 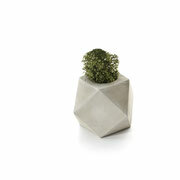 They are wonderful minimal touches in terrariums or flower bouquets. 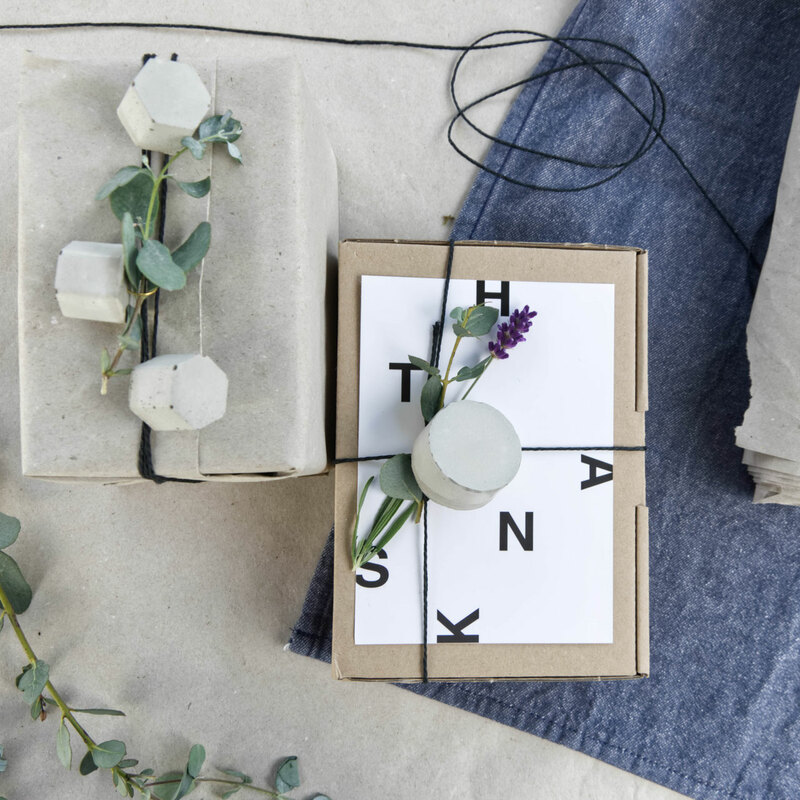 ... Psst ... You could also browse my blog for even more ideas and DiY's! 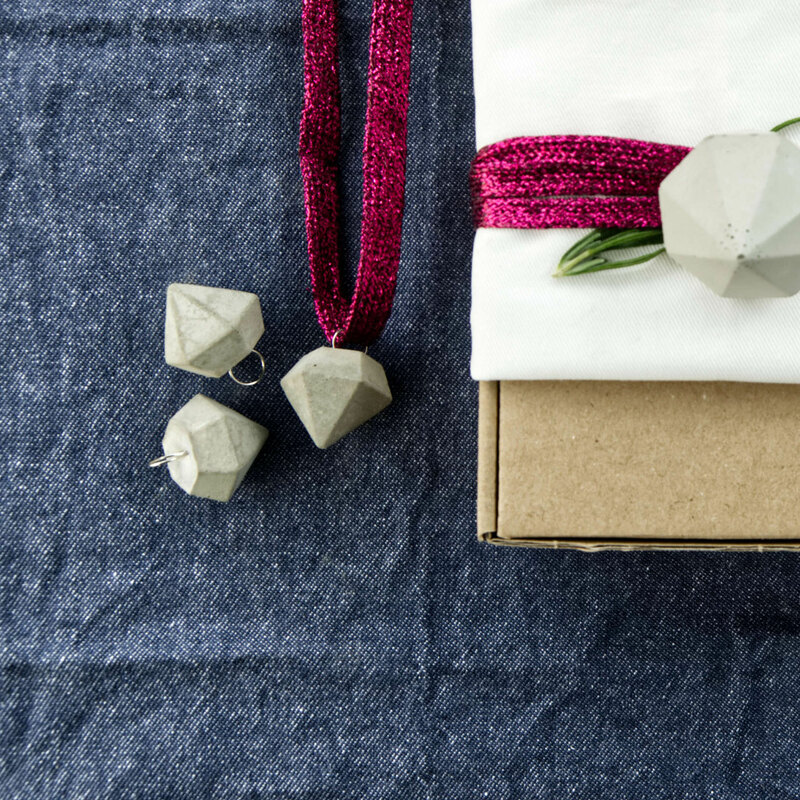 psst ... more designer above and below, enjoy! 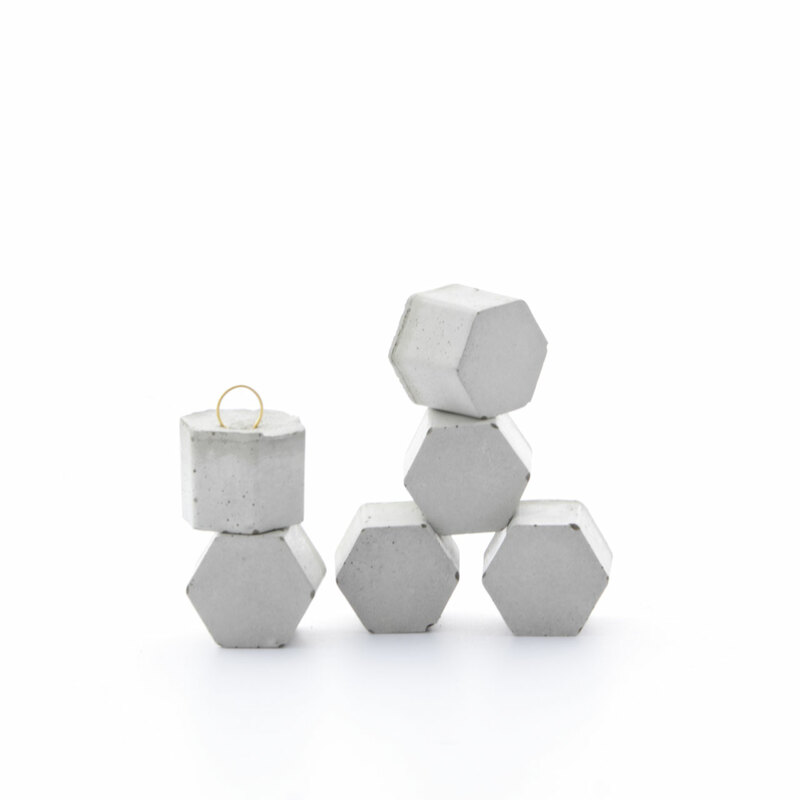 The simple cube as intriguing as always and an effortless modern ornament. 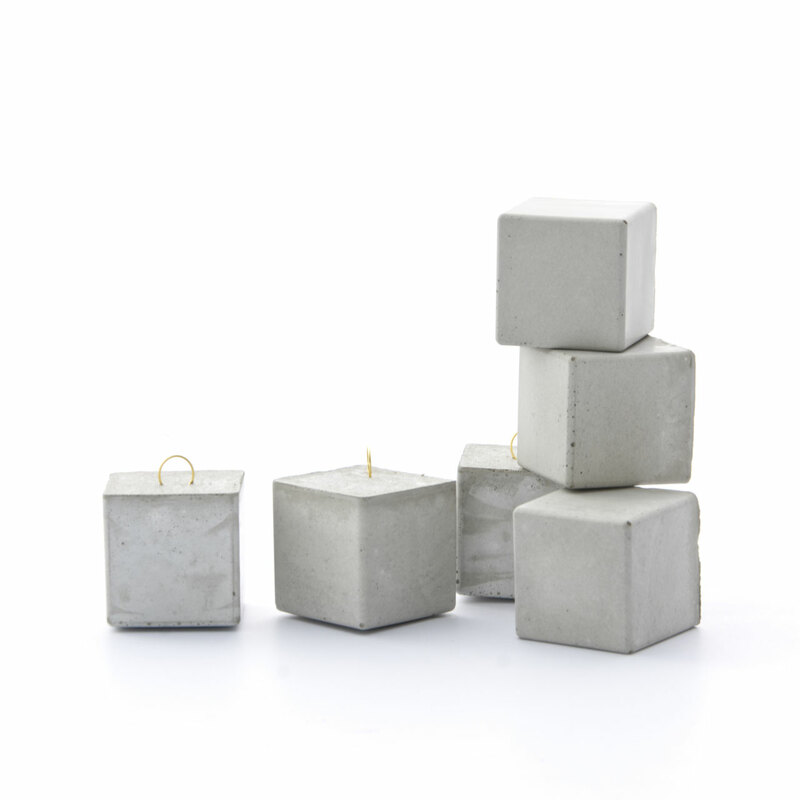 Each cube finishes with unique imperfections and in its own pale to mid grey colour due to the nature of the material. 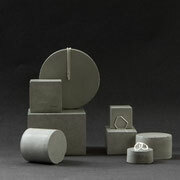 It creates a stunning contrast to full colours and blends in with pastels. 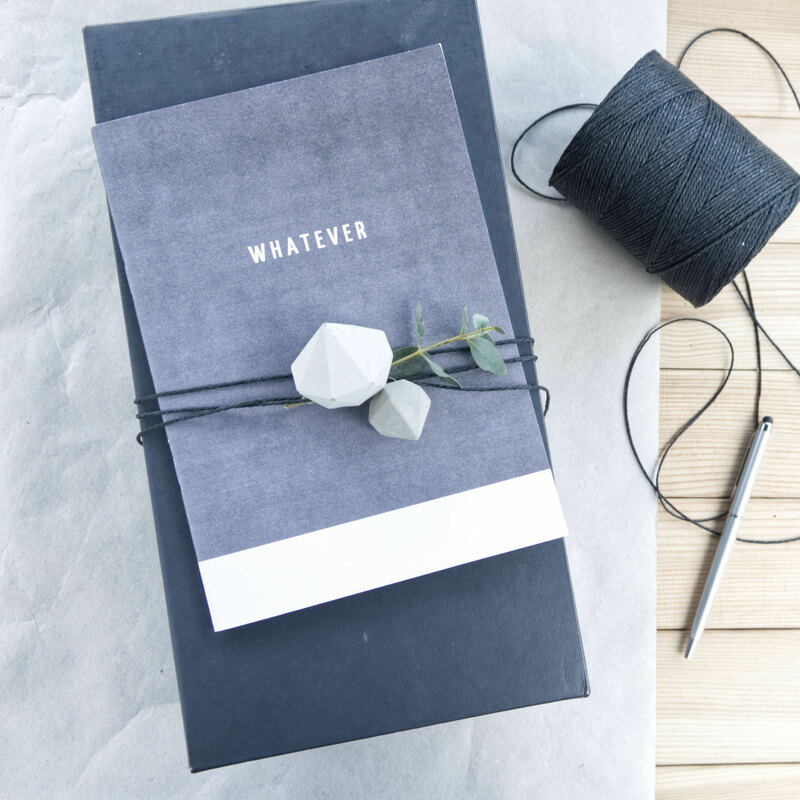 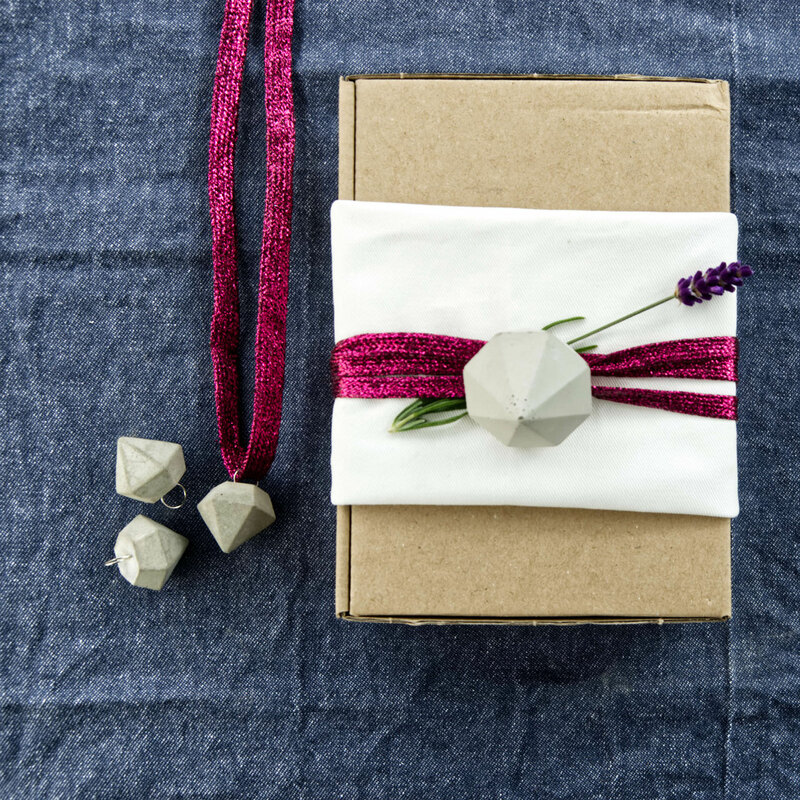 The inspiring images are just the beginning as these cubes are easily incorporated into table settings, gift wraps and wreaths, Easter branches, flower bouquets or your Christmas designs. 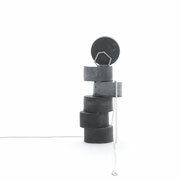 To make things even more interesting they have shiny silver or gold coloured wire loops. 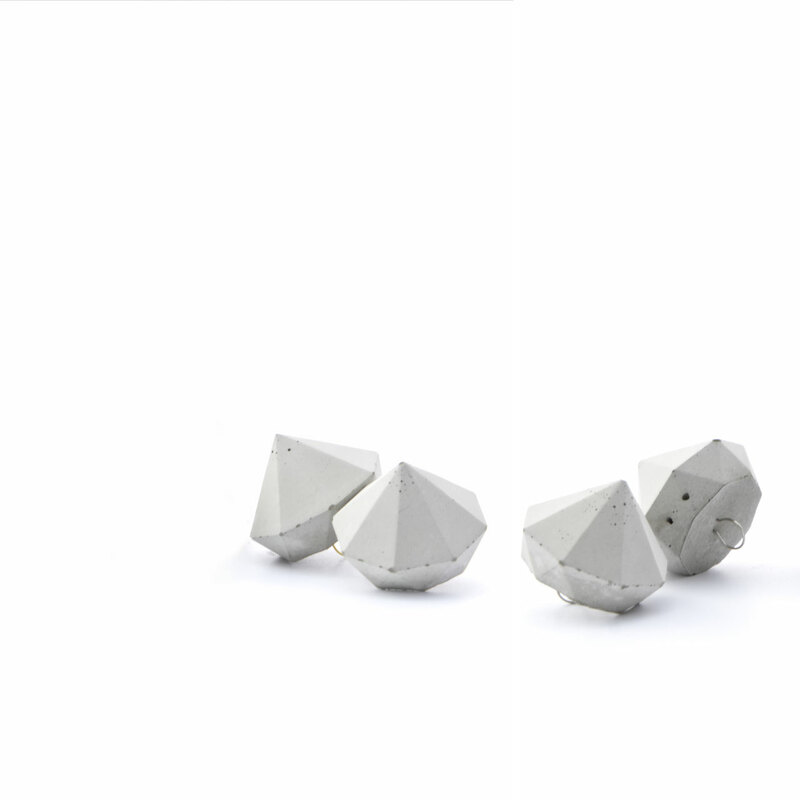 In a set of 3 cubes, two cubes have a centred loop which will, when for example wire hung, display like a flat based dice and one cube will have the loop to one corner which will display the cube similar to an octahedron [picture 3]. 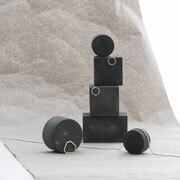 There are more designs above and below, enjoy! 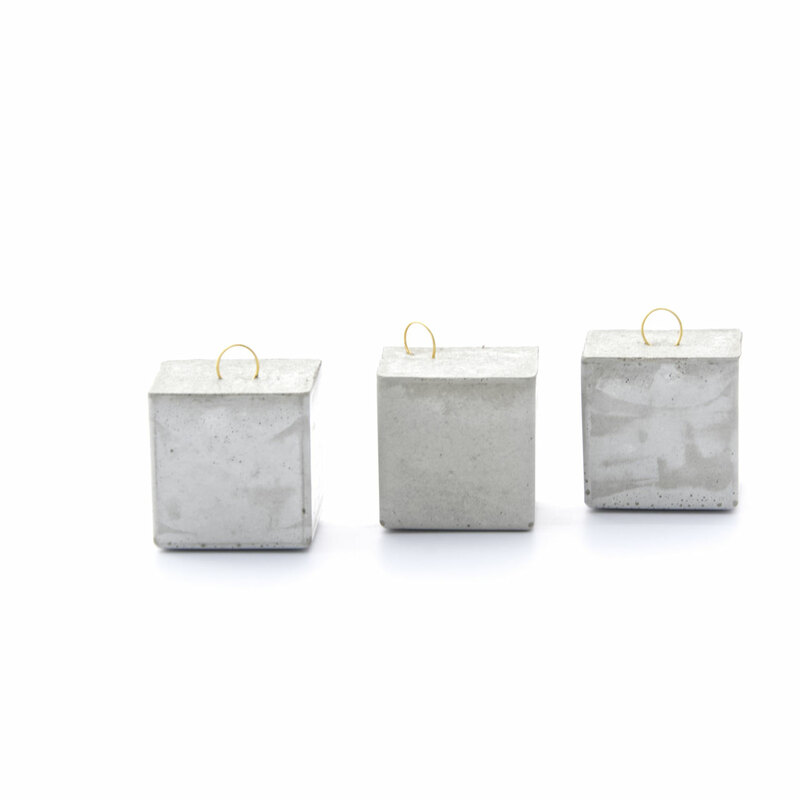 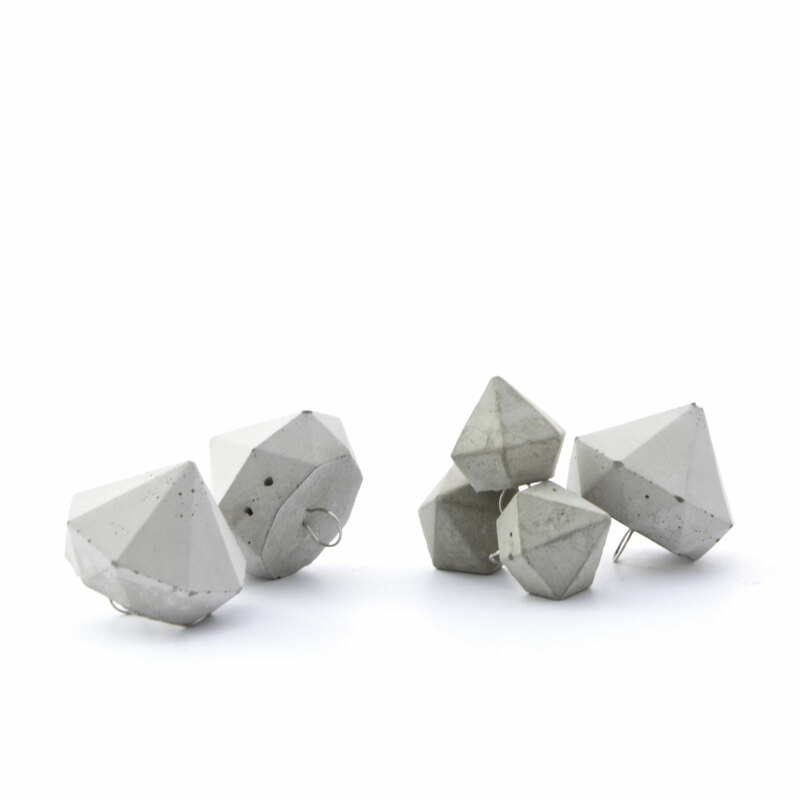 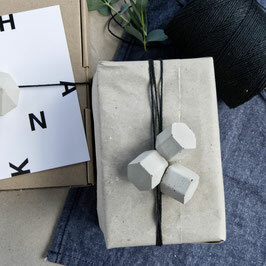 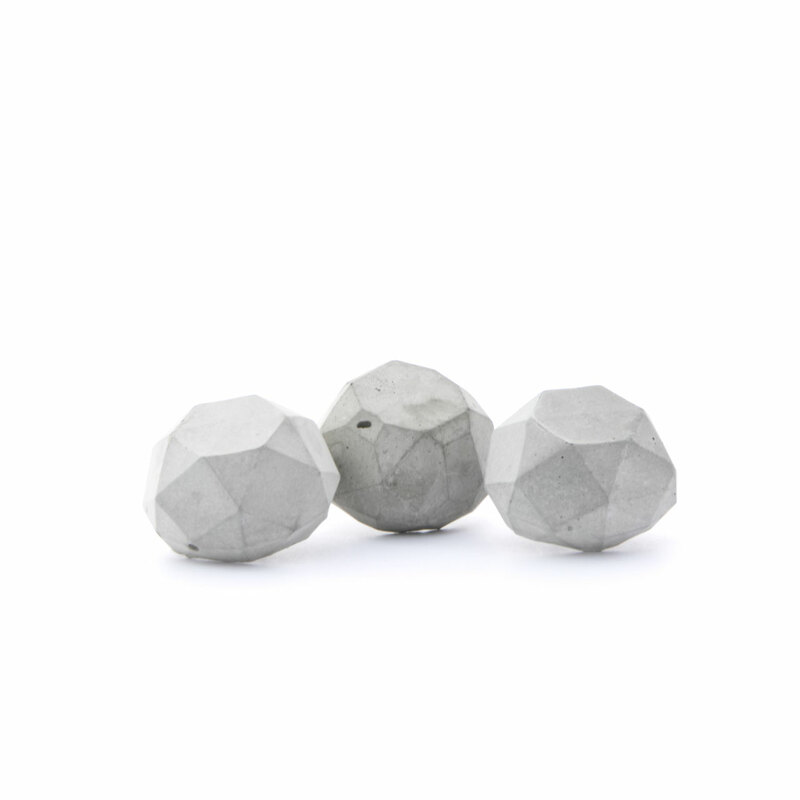 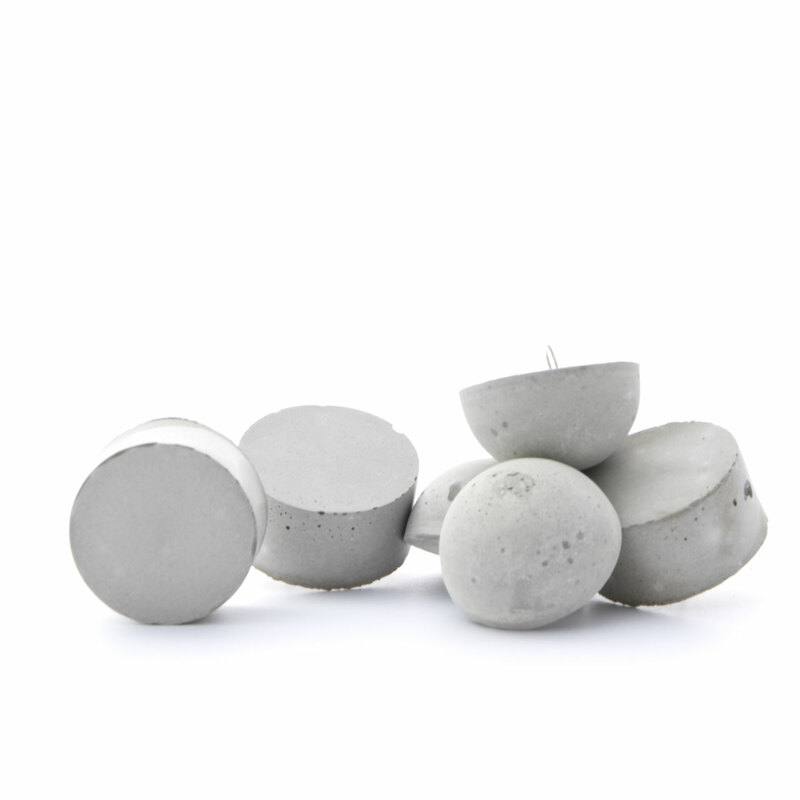 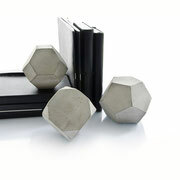 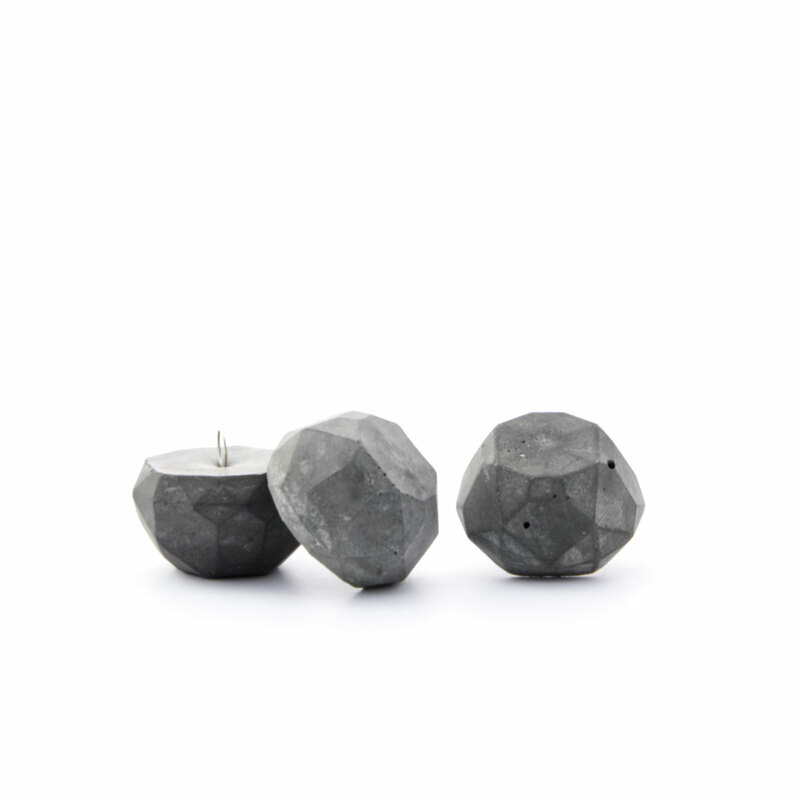 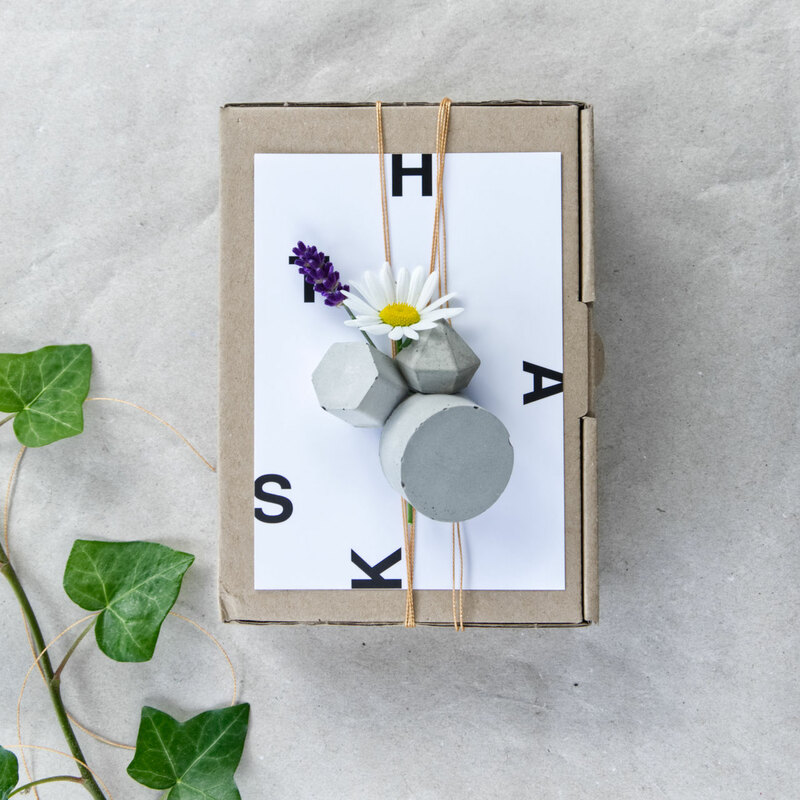 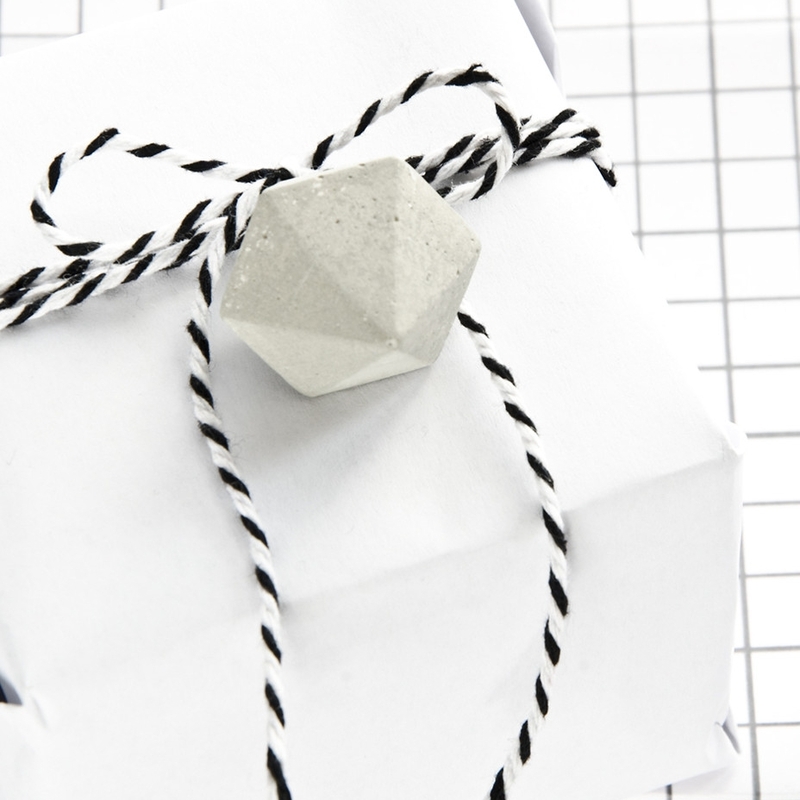 Edgy, tactile, intriguing - the concrete polygon faceted ornament set. 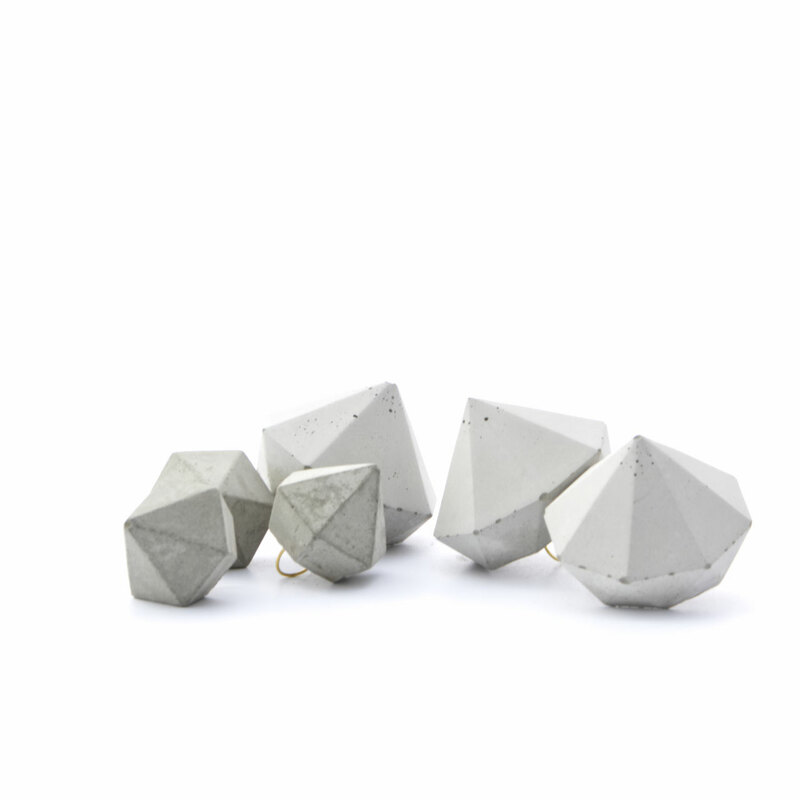 Playful and effortless the flat faces of this geometric ornament create an almost round shape. 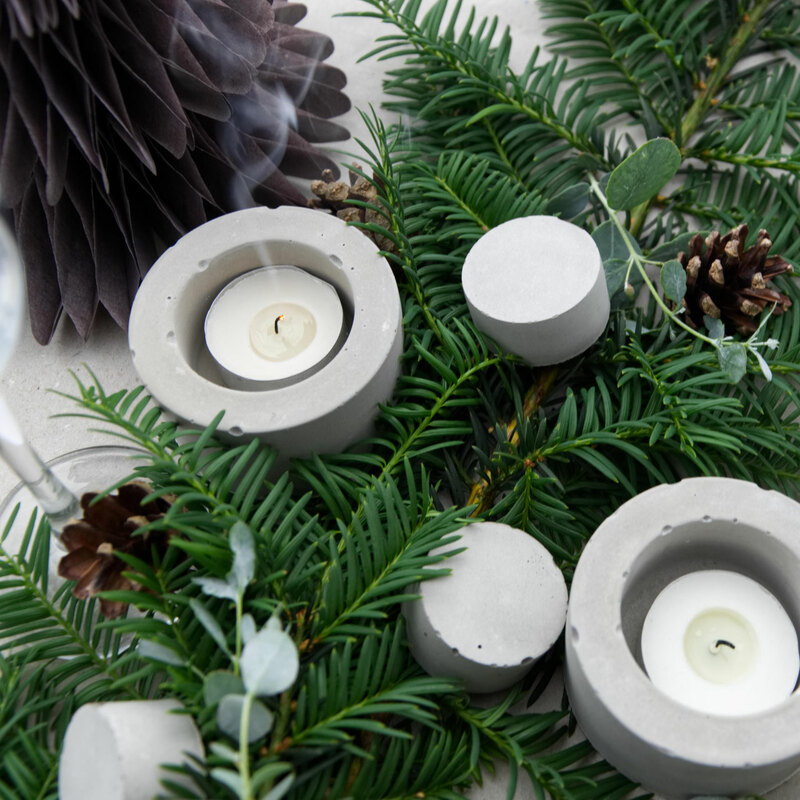 The grey tones offer a great contrast to strong full as well as pastel colours of your floral arrangements, wreaths or table settings all year around. 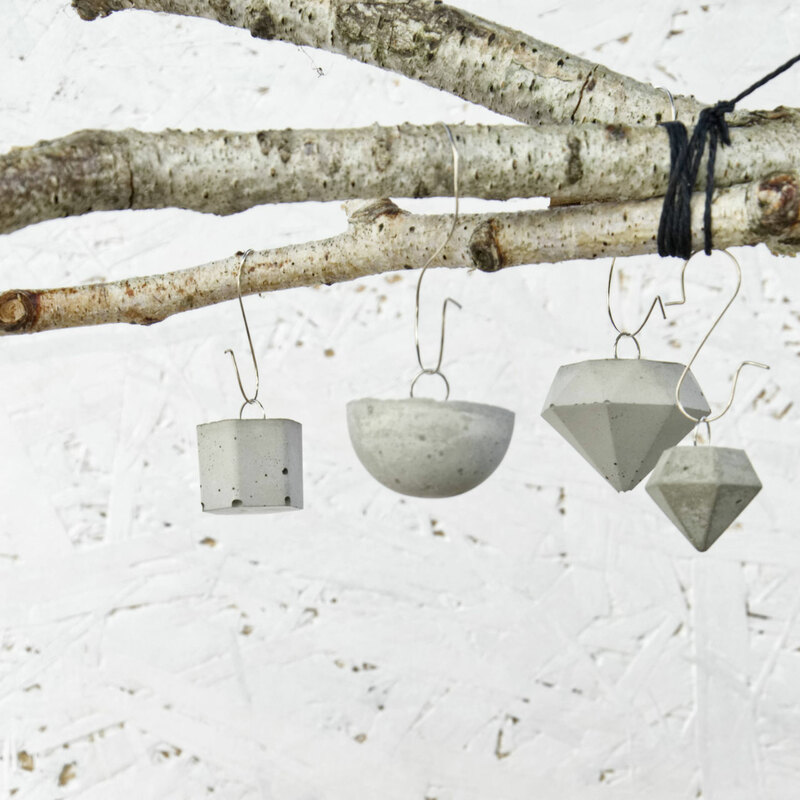 The inspiring images are just the beginning as these pendants are easily incorporated into gift wraps and Easter branches or your Christmas designs. 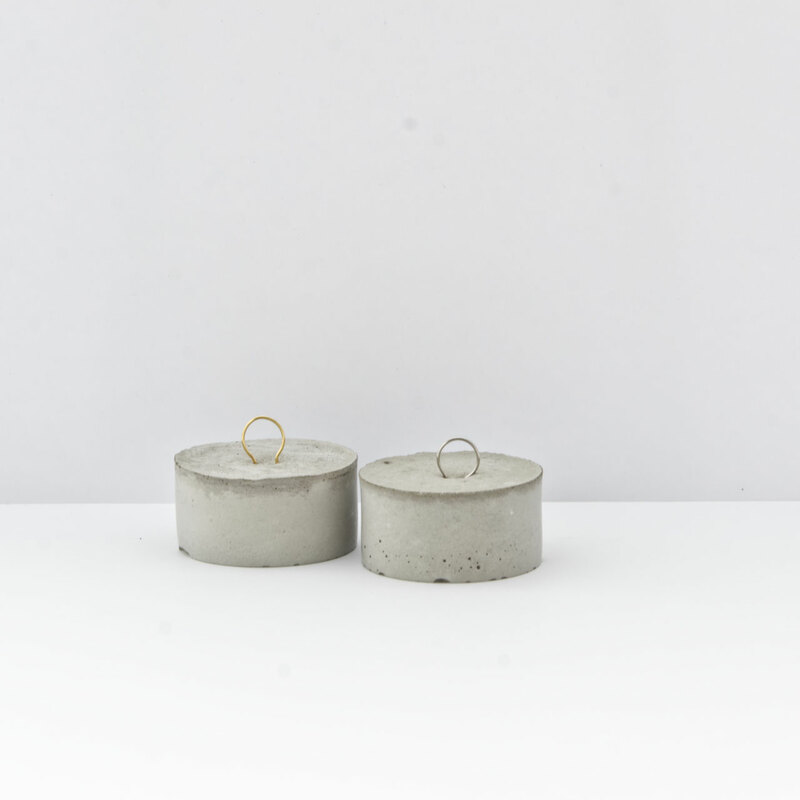 To make things even more interesting - you can choose between the finishes of the concrete and between silver or gold coloured wire for the loop. 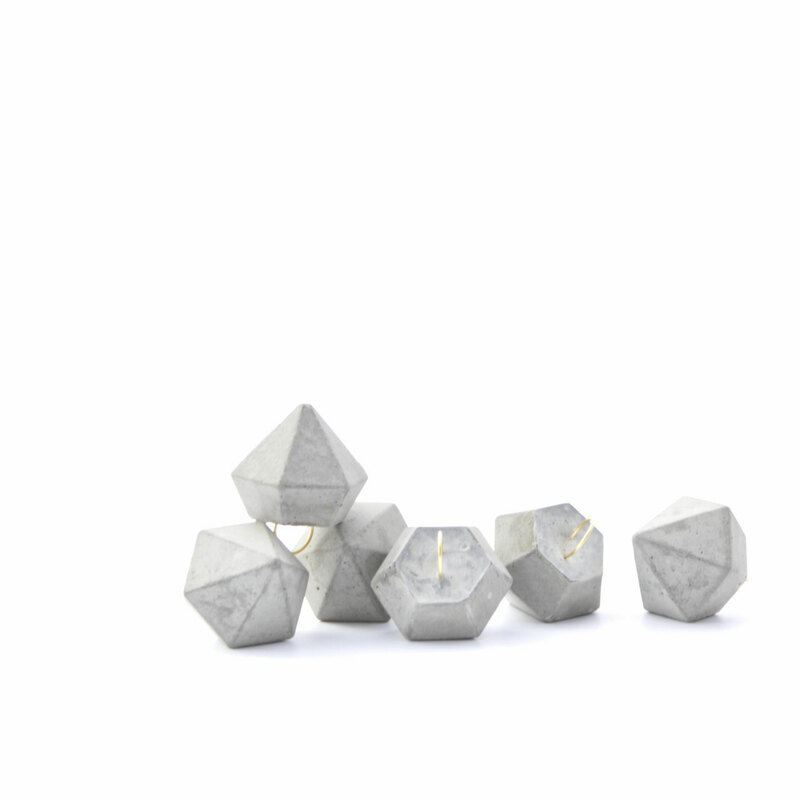 psst .. there are more designs above and below, enjoy! 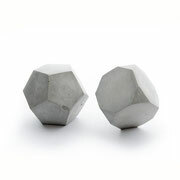 How to resist? 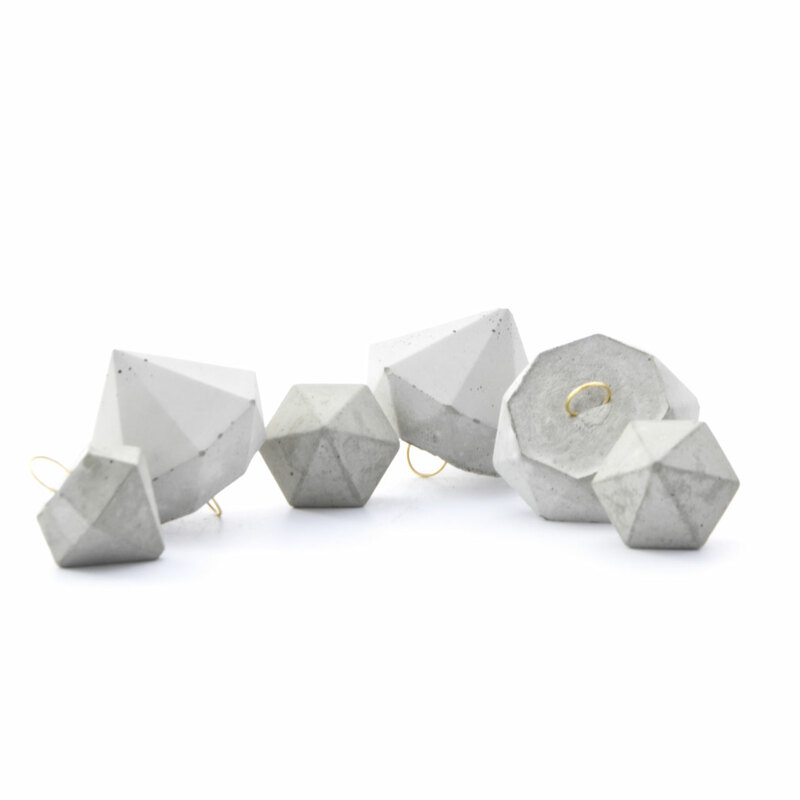 It's concrete diamond ornaments in two designs and sizes. 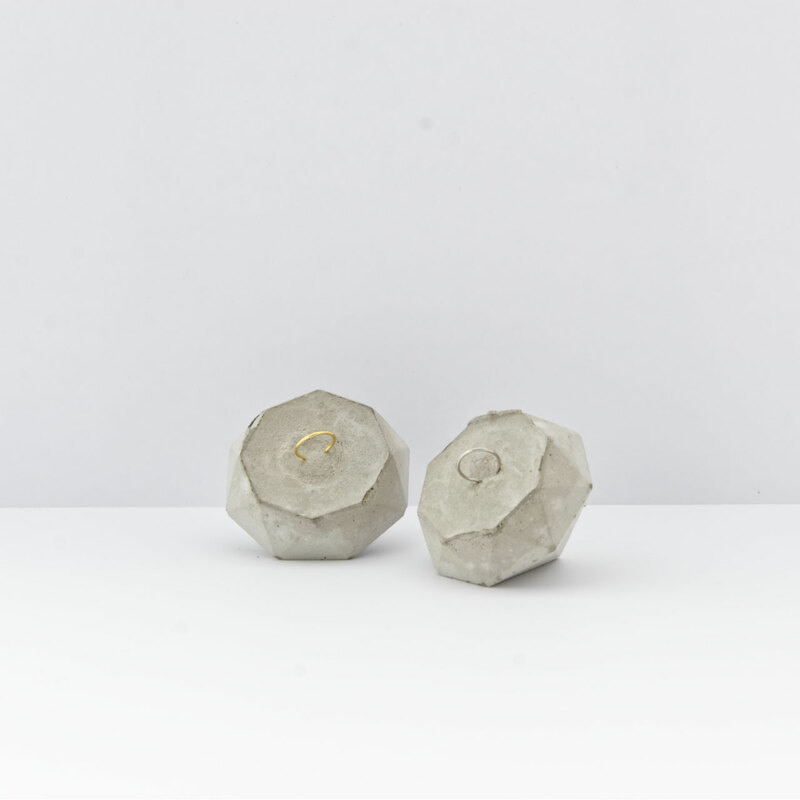 They are differently faceted and you can choose between a generously sized silver or gold coloured wire loop. It is easy to wire hang them or to string them up with your favourite twine or luxurious ribbon. 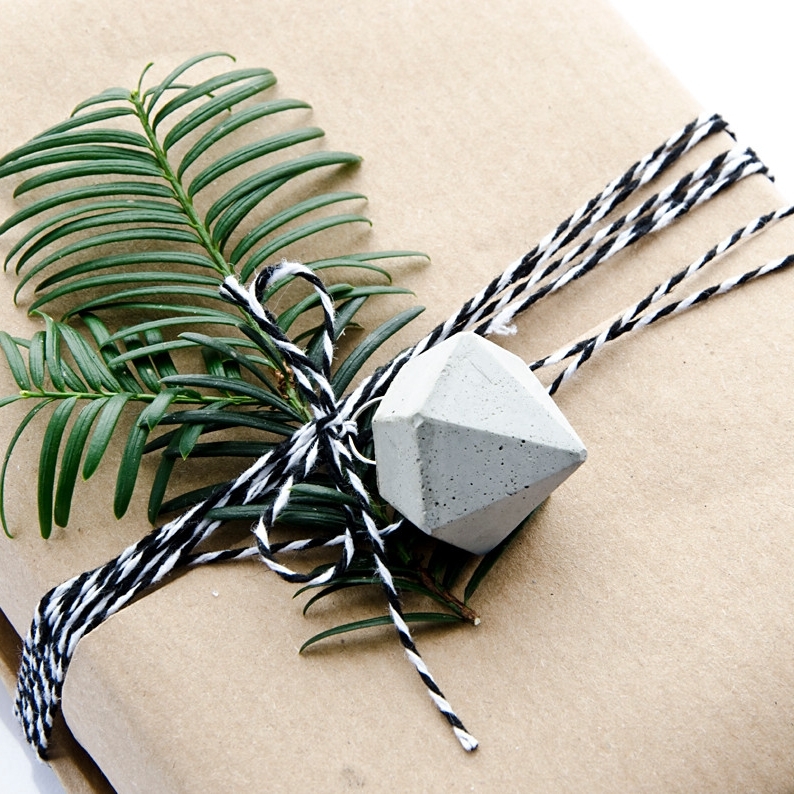 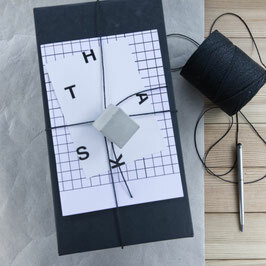 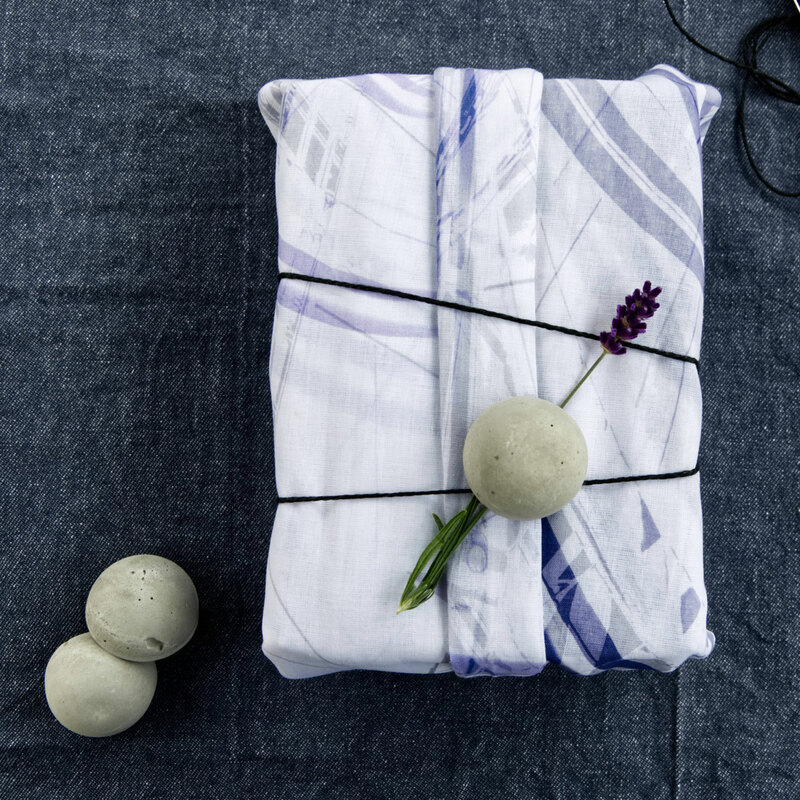 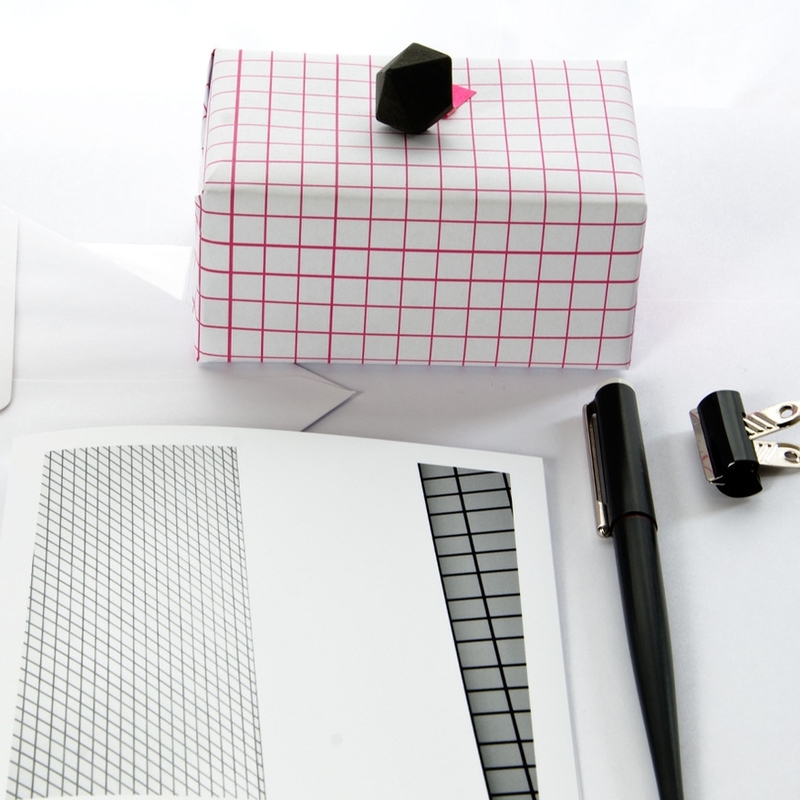 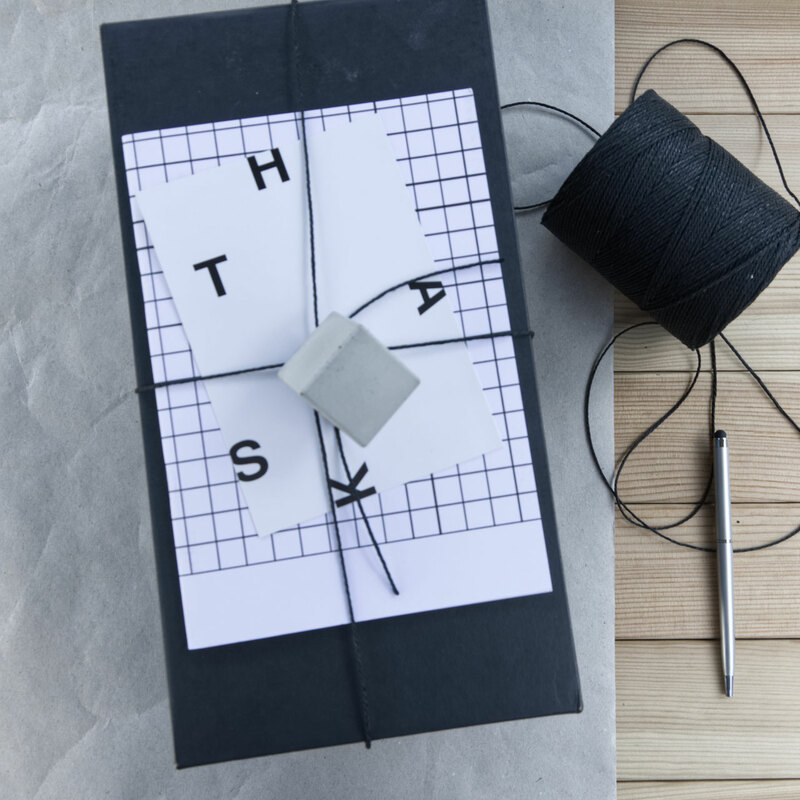 Added to a gift they will elevate the wrapping to a modern and eye-catching keep sake. 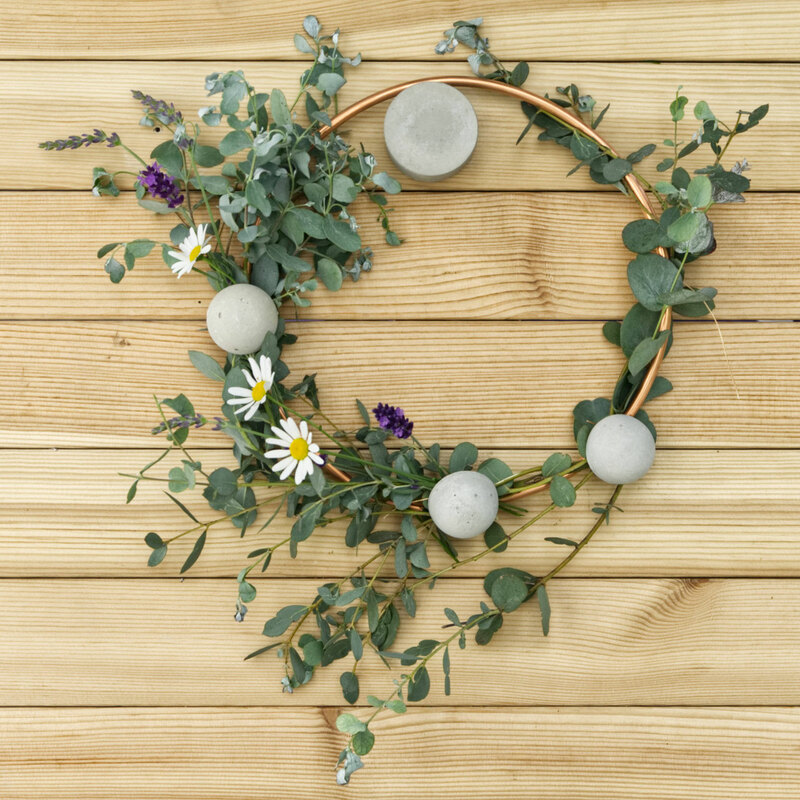 Incorporate them in wreaths or add them to an Easter branch or your Christmas decor. 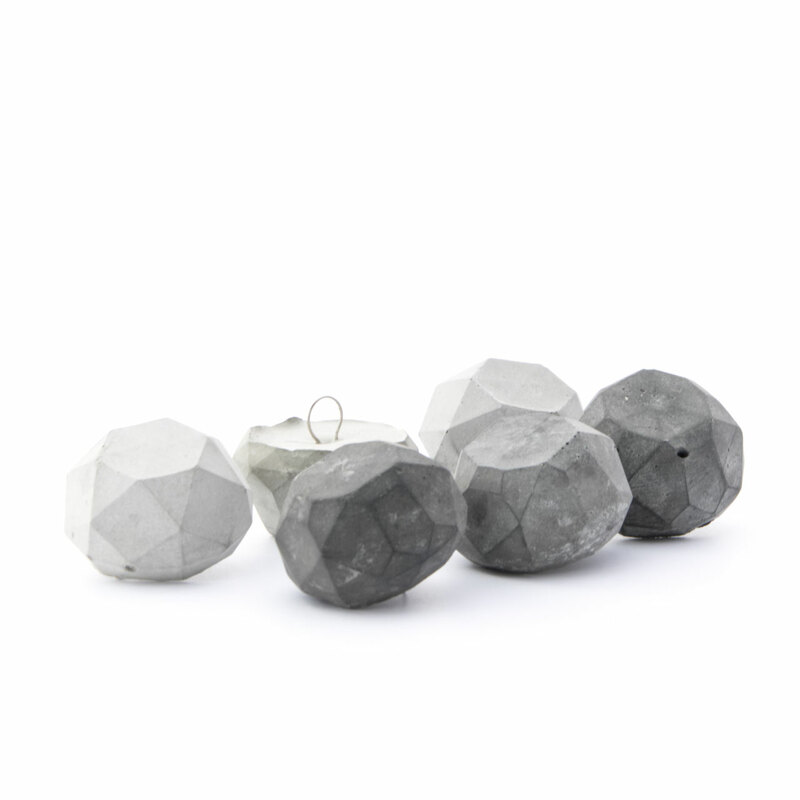 These diamond ornaments will add a stylish yet hygge twist to your arrangements all year around. 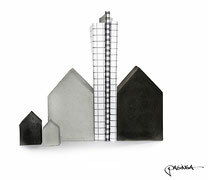 Have a look above and below for more designs and ideas, enjoy! 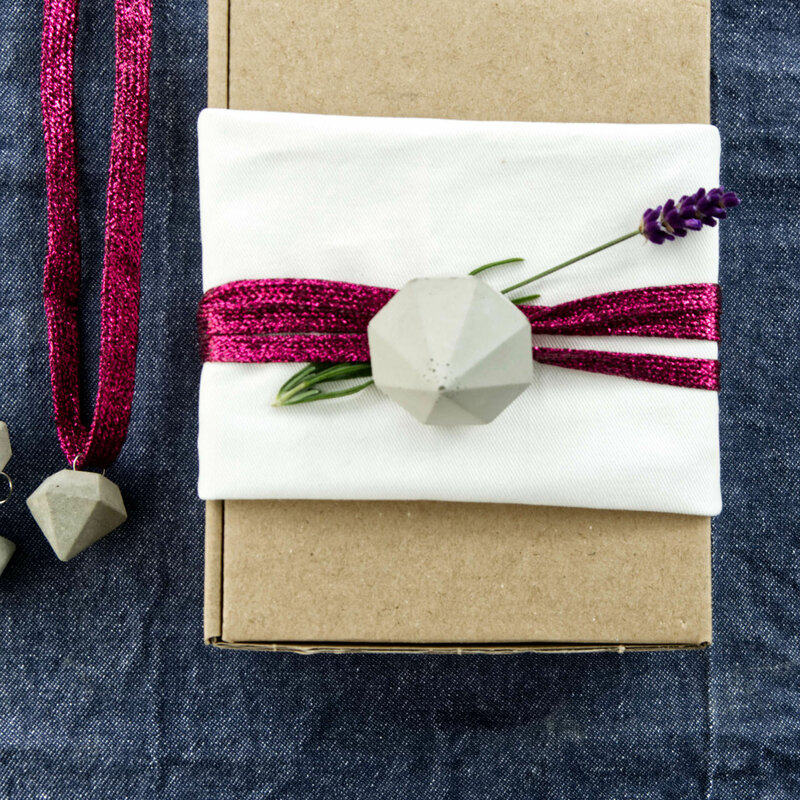 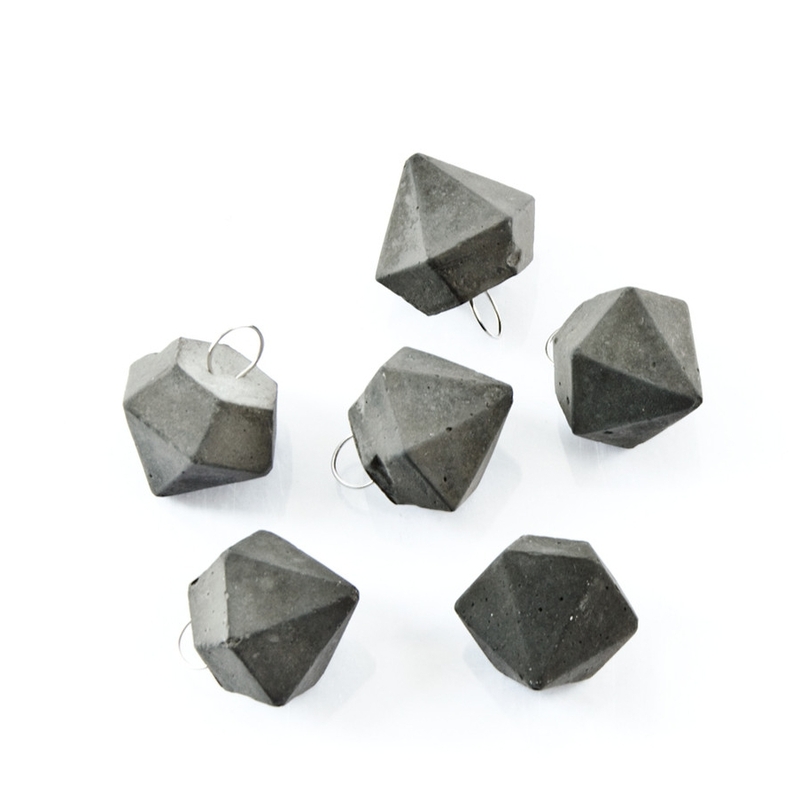 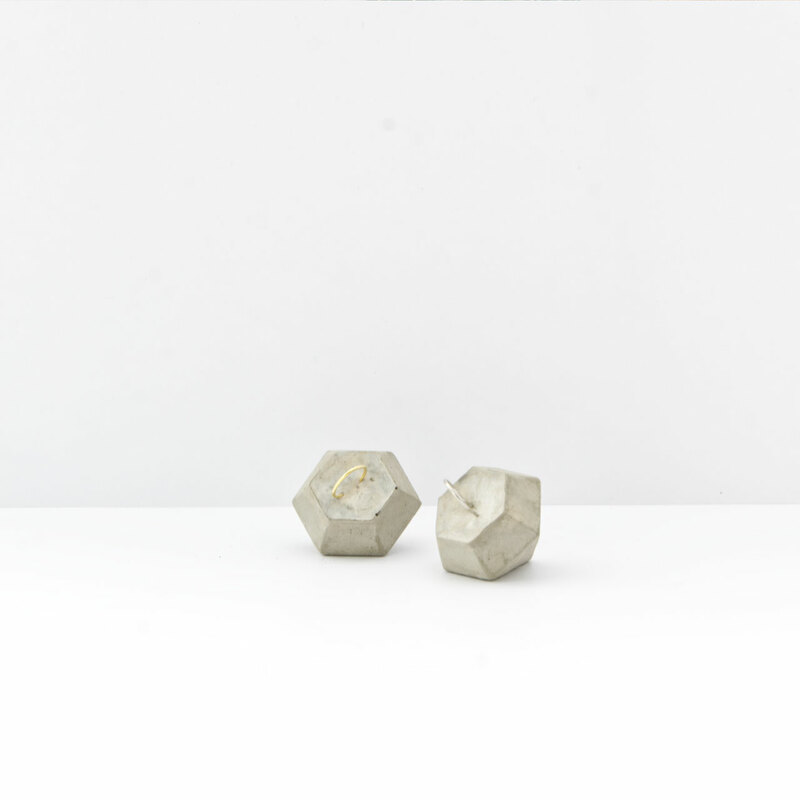 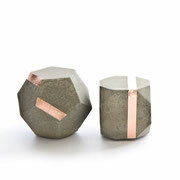 Diamonds – simple yet intriguing faceted concrete diamond ornaments. 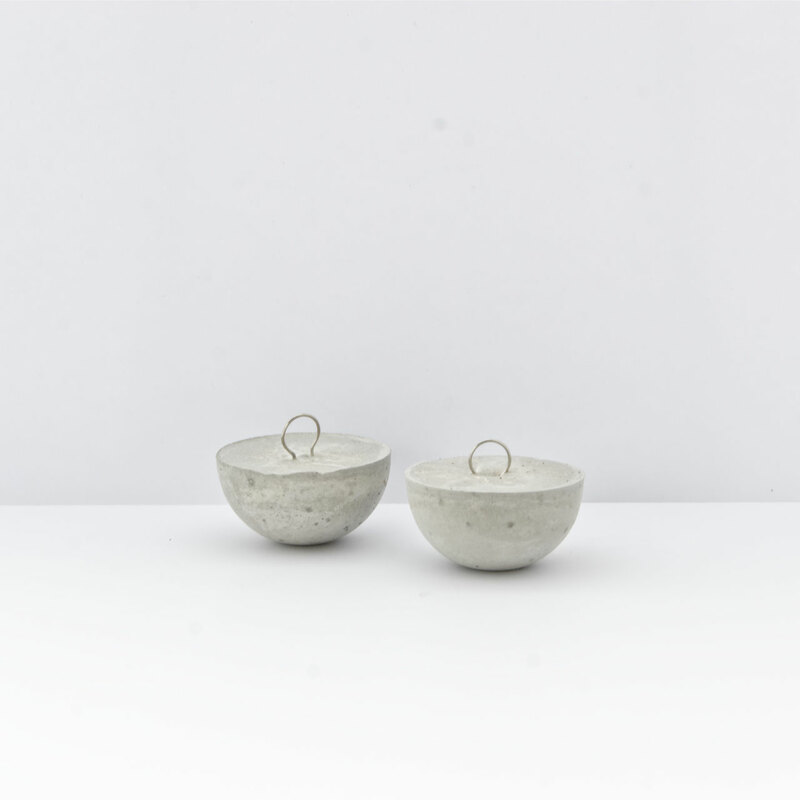 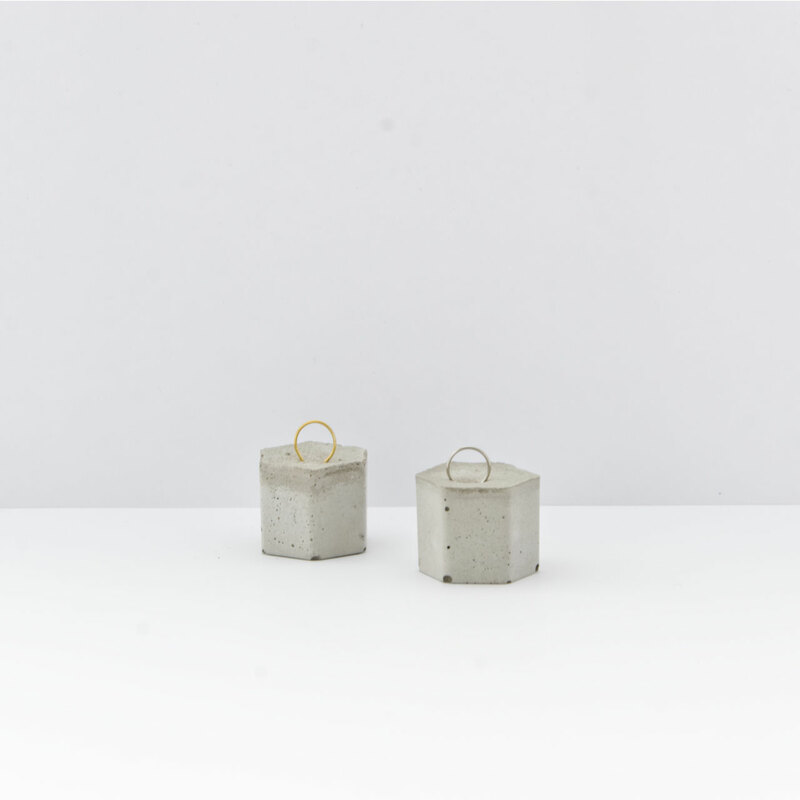 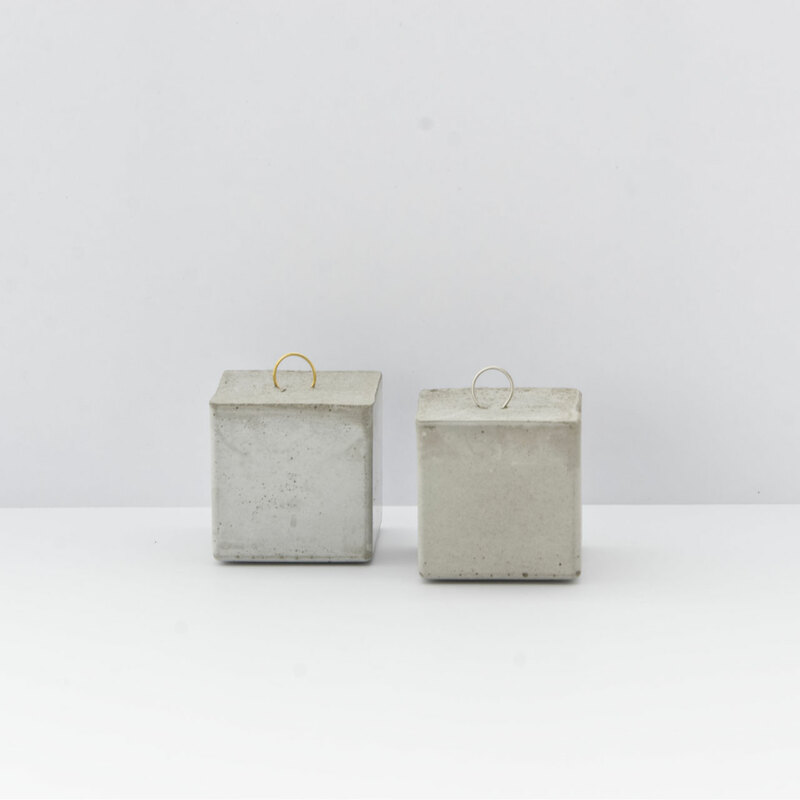 They are wonderfully tactile and finish with unique imperfections due to the nature of the material in shades of natural pale grey concrete. 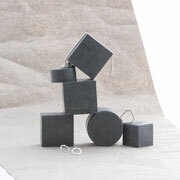 Customise your set in quantity as well as by choosing your preferred silver or gold wire loop colour. 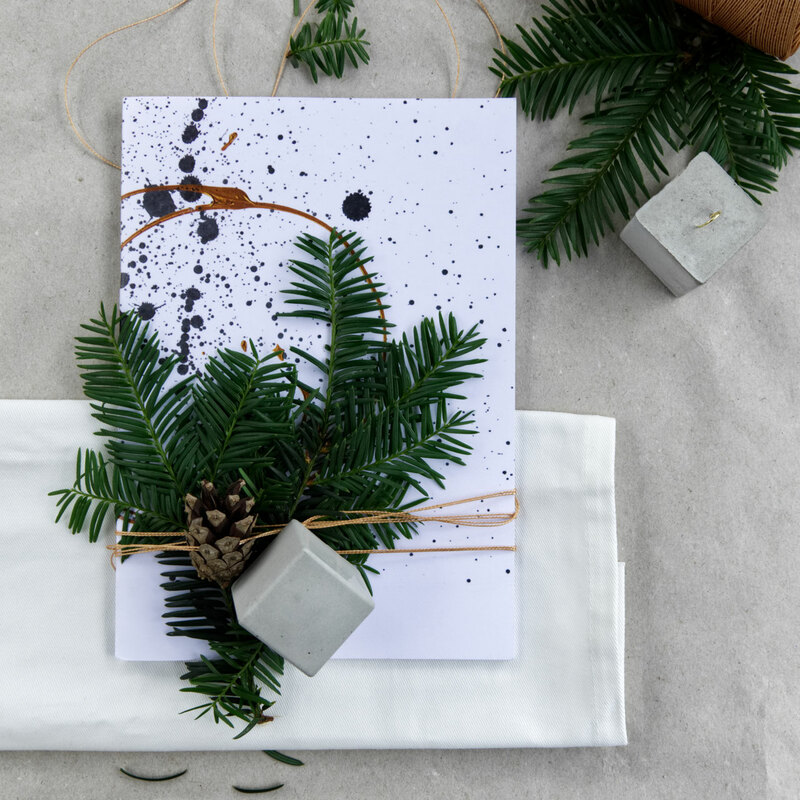 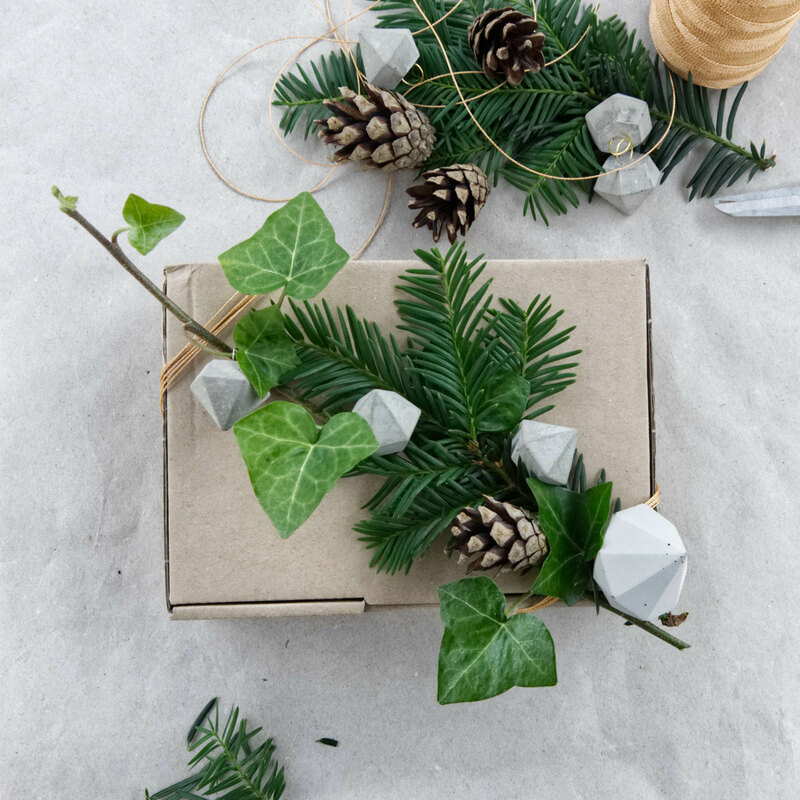 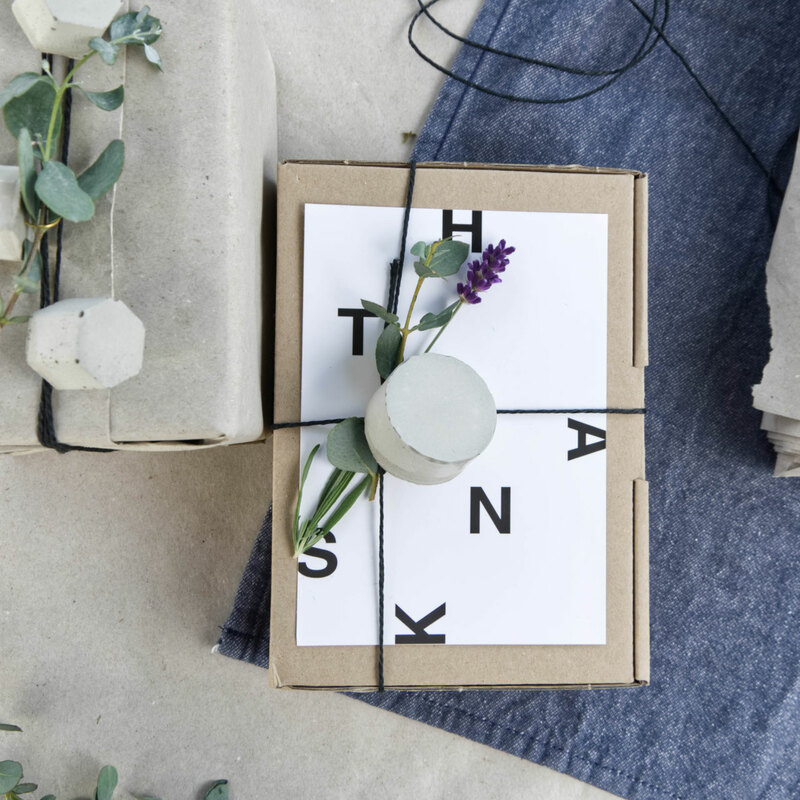 Give your table setting or floral arrangement a modern minimalist spin or simply use them to spice up your gift wrapping, wreaths, Easter branch or Christmas decor. psst ... more designs and finishes and decor inspiration are above and below, enjoy! 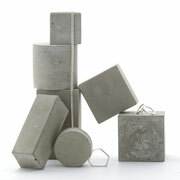 Gift Tag Concrete Diamond Set of 6. 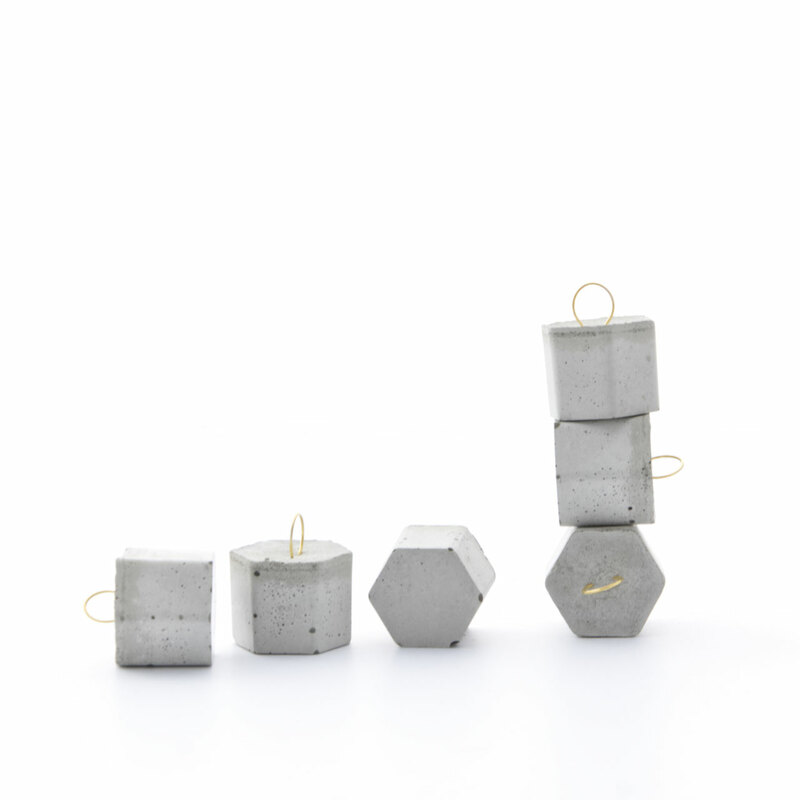 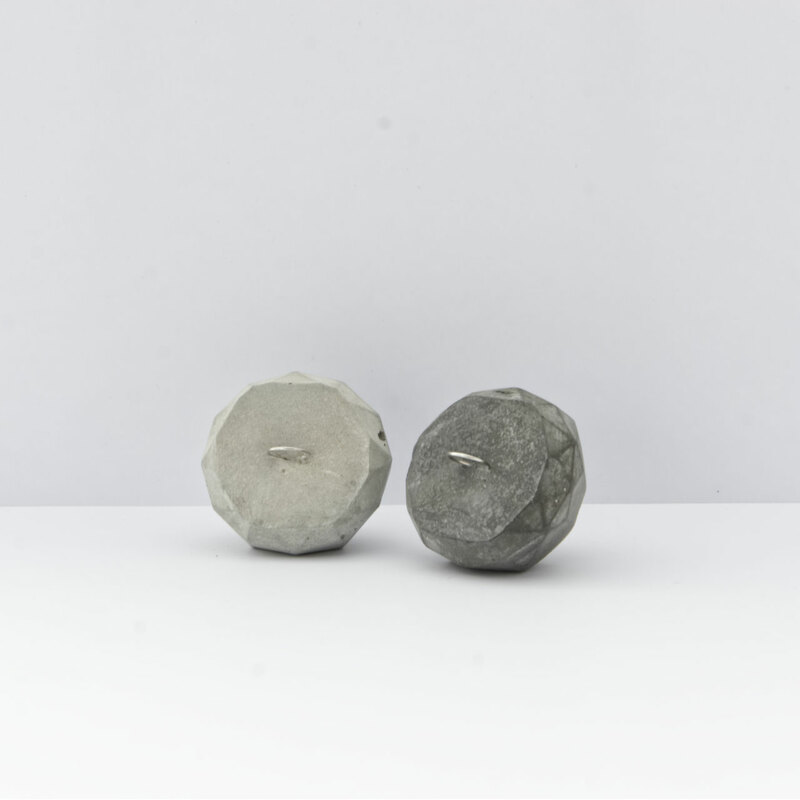 These concrete diamonds can easily be string or wire hung on a branch, your Christmas tree or anywhere you fancy. 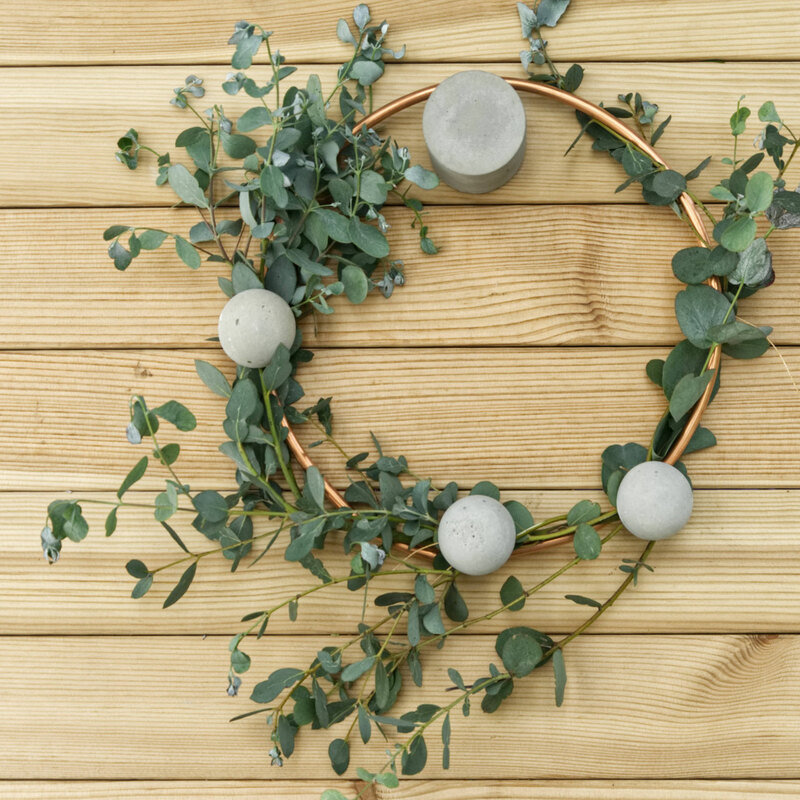 Nevertheless you could incorporate them in a wreath or in your gift wrapping. 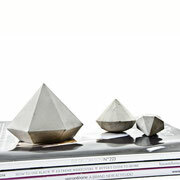 Have a look above, there are more designs and decor inspiration, enjoy!